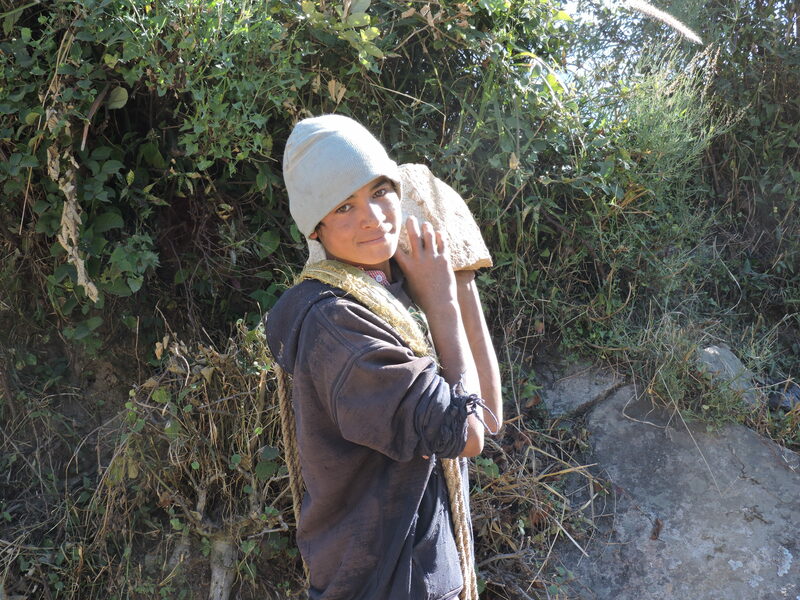 Hi Everyone, Greetings and Happy February, things are starting to slowly warm up in Nepal…but it’s still quite chilly out, and I’m hastily typing this update with what little solar power we have. I always find it so tricky to type, when my fingers feel like ice cubes! Cold weather aside things are going very well in Oda. We are brutally close to opening and moving into our facility which is wonderful, but has also been a huge test in patience. As with everything in Nepal, things are running a bit behind and mentally I’m ready to move in and begin work and implementation of our new clinic policies. Please take a look at the pictures below, which shows our new medical facility (the two story building), our patient waiting area (the gazebo in the center), and our new kitchen and tutoring facility (the long one story building). In addition the building progress we finalized a solar arrangement with Sunfarmer (http://www.sunfarmer.org), which was discussed in the previous blog post. We really hope this site will go a long way in providing a much needed improvement from the status quo in our area. I was reminded of this status quo last week when I went to a wedding 6 hours from Oda. I got to talking to the people from the area about their health system, and they said it was great relative to the rest of the district but still underwhelming. Based on the conversation, I asked them to take me to their government health post the following day. When I arrived I saw what I expected to see which was an inefficiently run facility, with far too few resources. 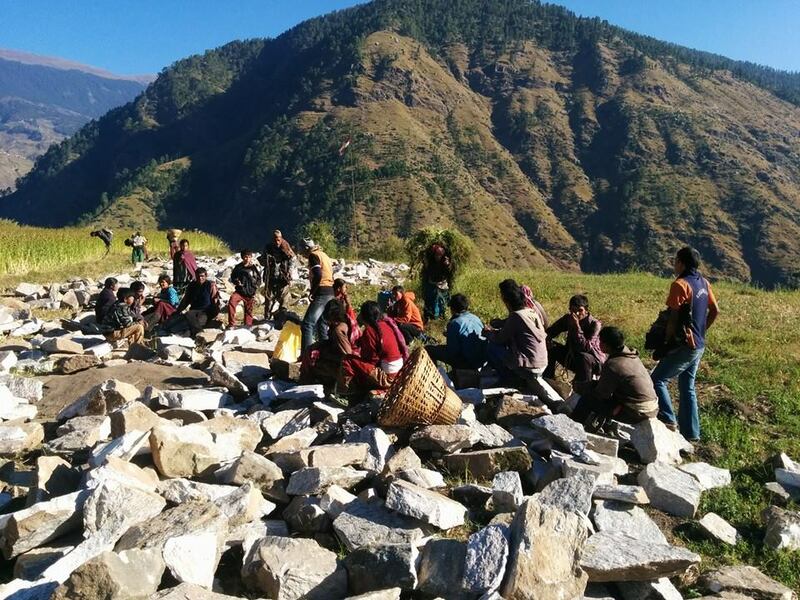 With only 25 medicines and an annual budget of $600 for medicine, it is nearly impossible for them to effectively treat the needs of the Kalikot people. It is our goal to efficiently manage our areas health system, while providing our medical team with the tools they need to succeed. Thanks so much for reading, and apologies for the brief post! While there is so much more to update on, cold fingers and a dying computer make it challenging to write much more! Thank you all for your support! First and foremost, happy 2015! I hope you all enjoyed the holiday with friends and family! Since the biggest change of the Oda Foundation’s young life is just around the corner, we wanted to kick off the New Year by telling you about our new site. Namely, a little bit more about the thought behind construction of the building, materials, bells, whistles, and so forth. Upon initial conception of this new facility there was a lot of debate regarding the primary building material. 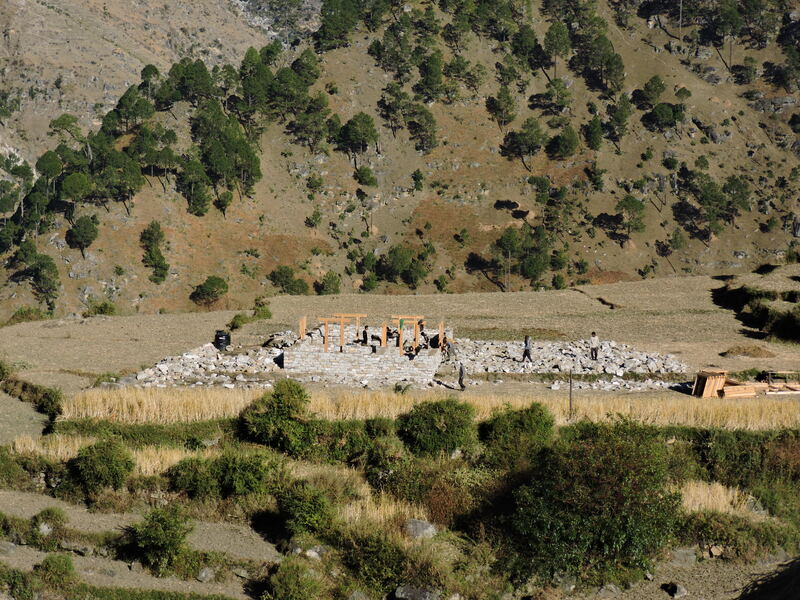 Often times in these villages there is an appeal to concrete construction, as it signifies wealth and thus a “successful” project. However, after consulting with the community and local master builders, we decided to instead incorporate centuries-old technology into the construction of the new building to have it blend in with the environment and natural landscape. 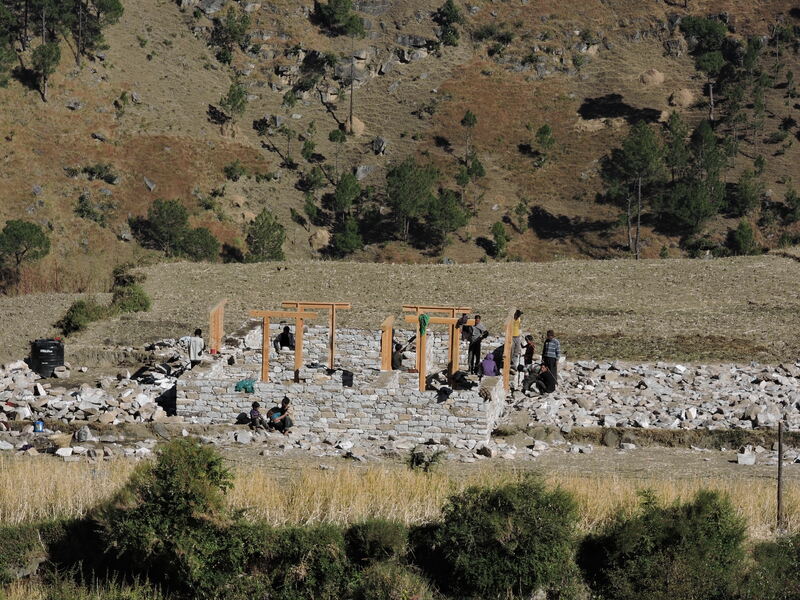 The primary building materials are stones chiseled out of the earthen hillsides of the community, and all of the door frames, windows, and support beams are sustainably harvested lumber from nearby forests surrounding the village. The project has been allotted a plot of land in the forest from which we pull or timber, and we work hard to only take what we need throughout the year. 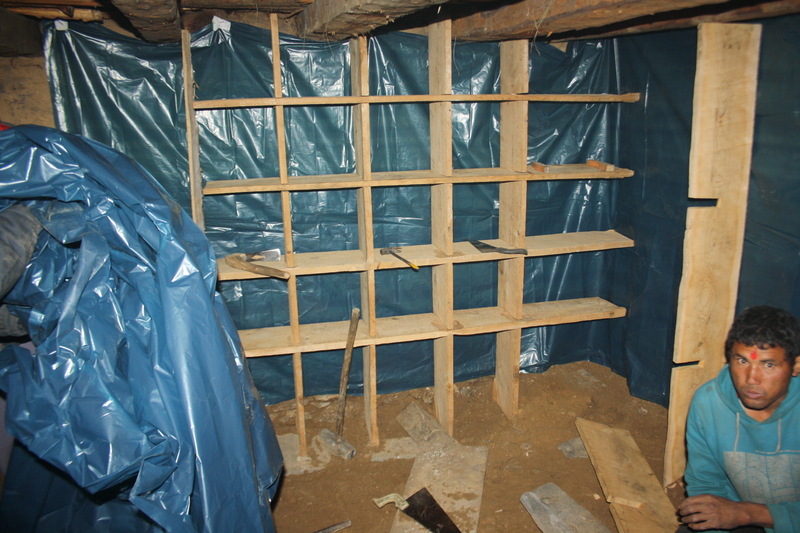 The inside of the building will utilize concrete (for sanitation purposes), but the outside will be daubed with mud. The mud/stone combination is a very sustainable material, mixing soil, twigs, manure, and water into a paste dried by the sun, which naturally regulates temperature and is extremely durable. The community gave us a choice piece of land and we felt compelled to build something which would not become an eyesore, the mud exterior should minimize visual invasiveness while providing functionality. The power from the building will come from a comprehensive solar array atop the building. The Foundation will utilize in-country resources to maximize the energy potential of our new structure. Additionally, we plan to utilize solar to power a series of WiFi relays that will be implemented in the region. 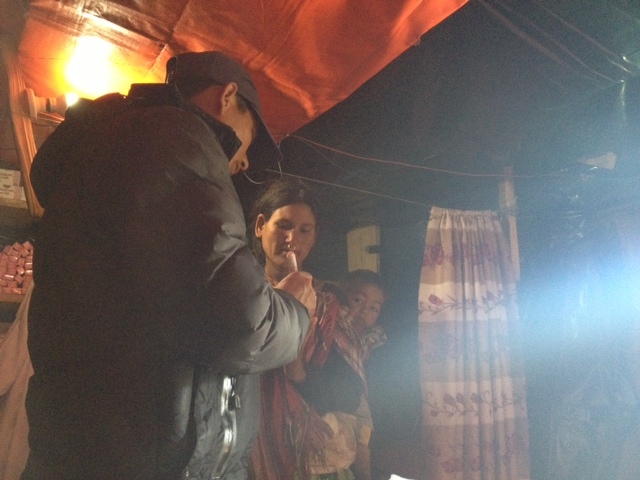 Working in concert with Nepali Wireless, our goal is to have Oda and the surrounding villages online in the next few months. 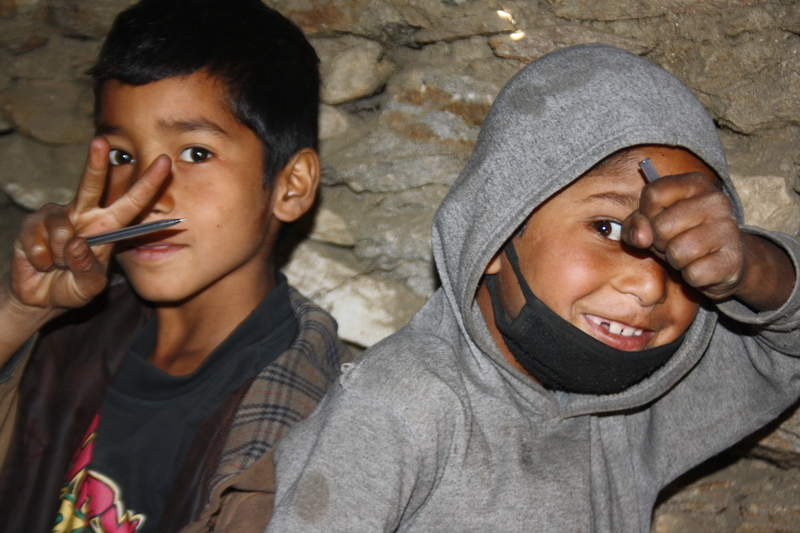 Nepali Wireless (nepalwireless.net) is an amazing NGO in Nepal run by a man named Mahabir Pun. He was recently elected into the Internet Hall of Fame due to his efforts in connecting nearly 200 rural Nepalese villages to the internet. He is widely regarded as a national hero, as internet in these rural communities is important for health, education, and communication purposes. Keeping the future in mind, the importance of a terrestrial internet will allow sites to communicate logistics seamlessly. All of this will be powered by sustainable solar energy. Our budding telecommunications infrastructure, further refinement of our healthcare model, and the recent road improvements are just a few of the reasons why we are so excited about the upcoming year. Hope everyone is doing well, we’ll have another update for you all soon! This is where the story takes a more positive turn. For those of you who unfamiliar with the birthing process (including myself as recently as six months ago), the large majority of babies can be delivered in a natural manner, with very little outside interference. If the head is down and the mother is healthy, then most of the time there should not be any major issues. That is not the case if the baby is coming out sideways or feet first. In this instance the baby was coming out in a breached position, and the family was in need of a medical professional. Thankfully Sarita was up to the task and quickly made her way to the pained mother. 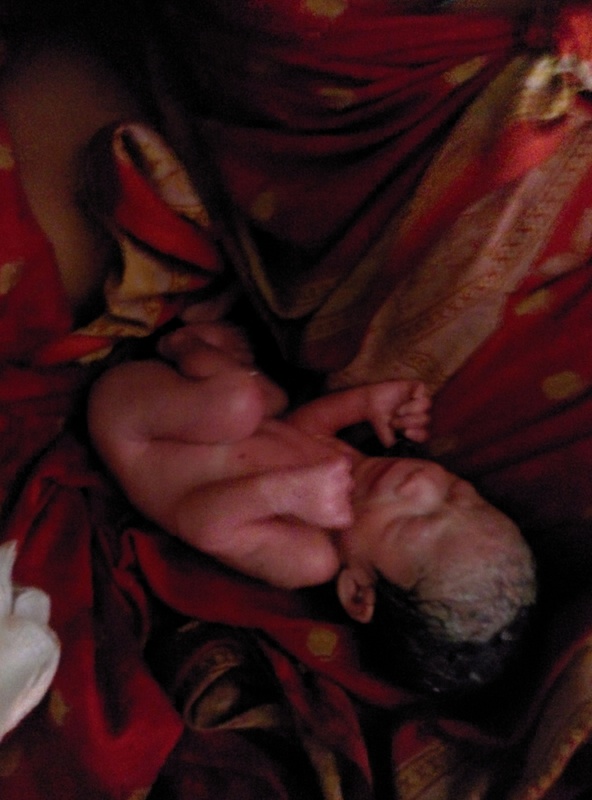 With the help of a sanitary birthing kit (thanks Adriel Booker, Cara Valentino, and the Love a Momma Community, (http://adrielbooker.com/love-a-mama/) and Mia Amicas Globally) and her training, she was able to successfully guide the newest member of Oda into the world. 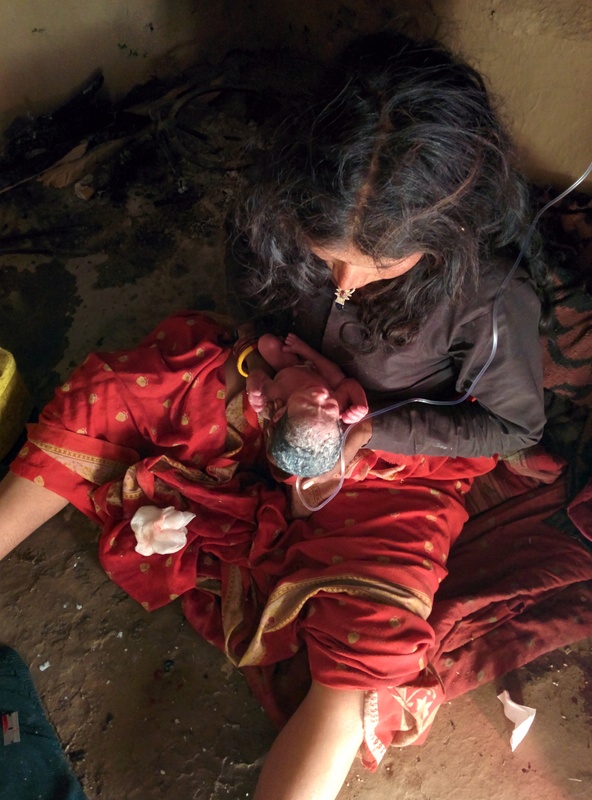 This successful delivery, resulting in a healthy mother and child, made our day as we reflected on the difference our little clinic in the mountains can make. It gave us lots to think about and be grateful for, as we wondered just what would have happened the Foundation not been there to assist the mother and the baby. These thoughts still stick with me, and have been instrumental in crafting my attitudes towards the future of our clinic and our project. The longer I’m here the longer I recognize the huge need for the most basic medical treatments. Though we have treated thousands of patients in year one, there are hundreds of thousands in our District and Zone who lack such basic care. 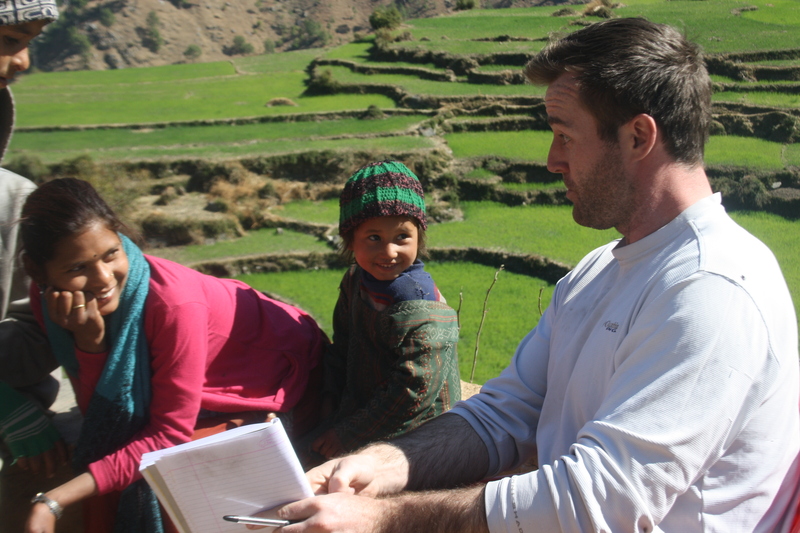 It is our goal to continue working with local communities as we expand our sustainable, locally driven programs with the aim to improve education and health outcomes in Kalikot and the remainder of the Karnali Zone. I look forward to updating everyone more in the coming couple of weeks, with more stories from our most recent stay in Oda along with more detailed plans for what should be an exciting 2015! Hi everyone, yesterday was the one year anniversary of our clinic in Oda! I want to say thank you to everyone who has given us support in the past year, we are all so appreciative of your generosity - this project truly would not be possible without you! I can’t believe that a year has gone by already. It feels like just yesterday that I was getting used to life in Oda, and we were digging out a shed to use as a clinic. After 6,000 patients and a huge number of highs with almost as many lows, I couldn’t be happier with where the Foundation is today and where it is going. I plan to post a more comprehensive update when I reach Kathmandu, but unfortunately, I don’t have much time or computer battery life right now. Bobby and I made the drive to Manma (the capital of Kalikot) this morning, and arrived to a very cold and very cloudy city. Very cloudy means not a lot of power, as pretty much everything in this district runs on solar. To make things a bit more complicated, it has just started to snow so Bobby and I are holed up in our room with not a whole lot to do! Despite these minor technical difficulties, I still wanted to provide you all with a quick glimpse into our latest progress. Our new building is roughly halfway complete, with people coming to help out from all over the district. 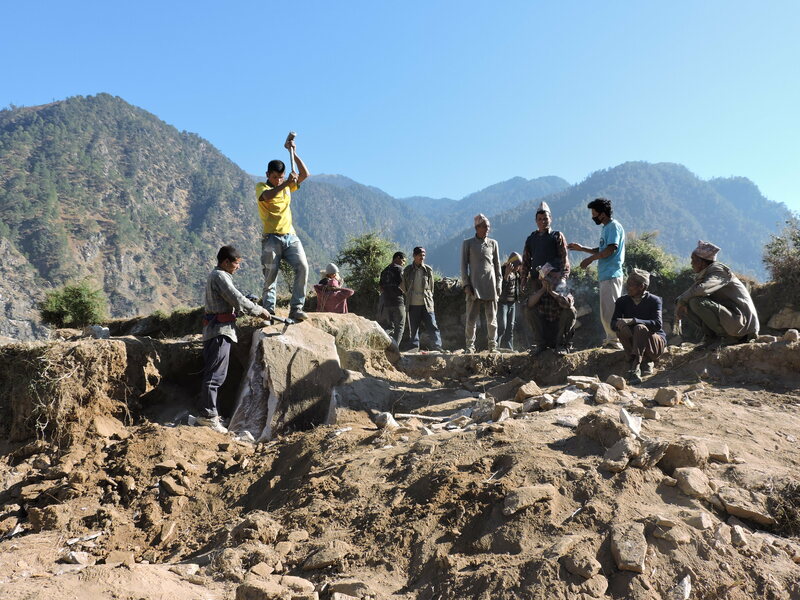 In the video below more than 50% of the laborers were on site working voluntarily in support of our mission to bring affordable medicine to the people of Kalikot. This is a fantastic testament to the co-investment approach we are seeking as a Foundation. It is not just Bobby, myself, our team, or our foreign supporters contributing, this project and our efforts have truly become a team effort with “all hands on deck.” With the donation of land and labor we could not be happier with the work being done by our community. 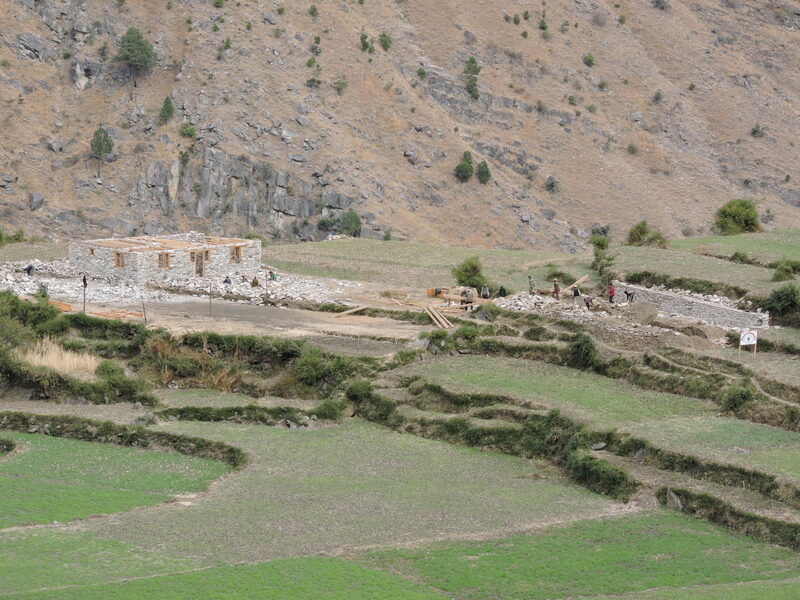 Our desire to provide affordable and quality health care to the people of Kalikot and the Karnali zone could not be off to a better start! I am so appreciative for everyone who has supported this project. 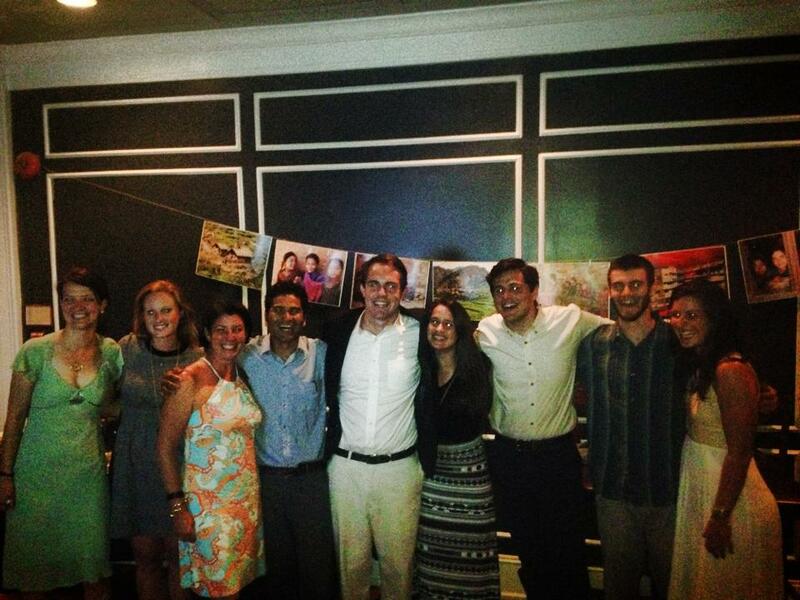 Not only has the Oda Foundation grown so much in year one, but I have grown immensely as well. Everyday I am faced with challenges as our project continues to take shape, whether dealing with management issues or handling complicated social dynamics, I am a far different person today than I was on December 12th 2013. Yet, through it all I have been welcomed into a community of incredible people and have been able to find a beautiful home-away-from-home here in the mountains. Every single day I continue to learn and grow from the work that we are doing and from the amazing people that surround me, and am confident that what we are creating here will have a meaningful impact in this region for decades to come. On one final note, I wanted to thank the Oda Foundation Board and our Advisory Board for their fantastic work while I’ve been “off the grid.” Without a reliable, hardworking, and passionate group of people supporting us this would be impossible! Thank you so much! 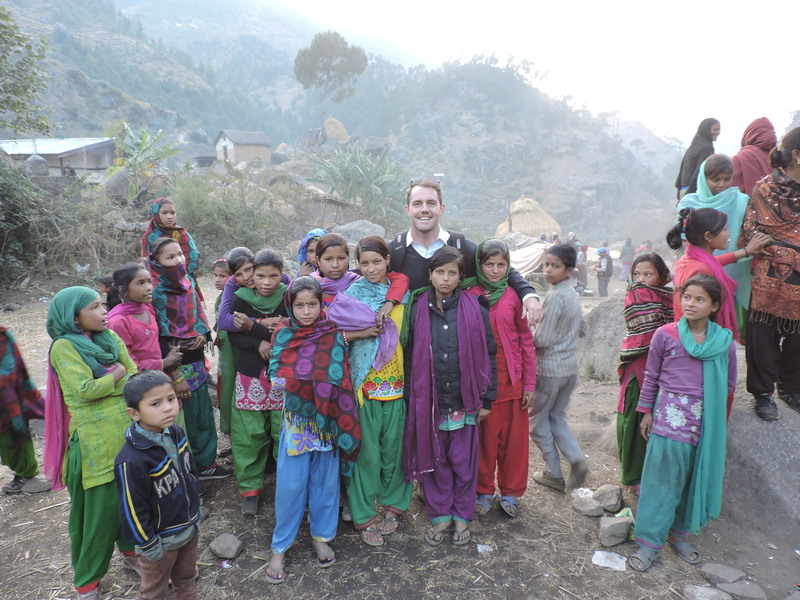 For anyone interested please take a look at Oda Foundation Board Member Kirk Adamson's recent talk about our work in Nepal! Hi everyone, I hope all is well with the world and everything is more or less how I remember it. To that end, one of the major goals of this trip for both the project and my own sanity to keep in touch better with the outside world. The road between Sarabarah and Manma (the District Capital), has improved greatly since my last trip, which combined with our motorcycle being up in Kalikot allows us to travel back and forth from the Capital with much more ease. 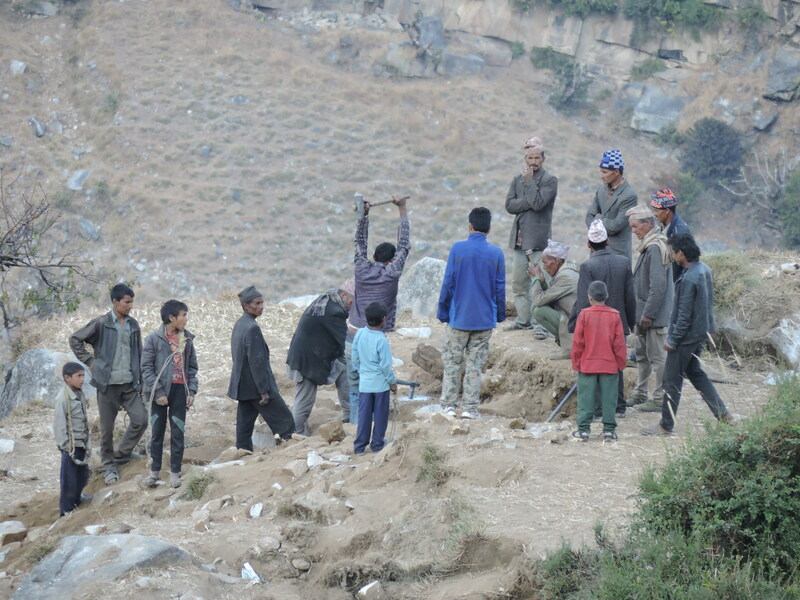 For some more background on Kalikot, there have been recent developments with regards to the “Karnali Highway” which is due in large part to contracts associated with Hydro-Electric projects in the Upper Karnali Region. Very recently, India signed a power sharing agreement with Nepal to reap some of the benefits of the hydro potential. To accommodate the need for advanced machinery and man power reaching the region, we have seen a huge uptick in work on the road. 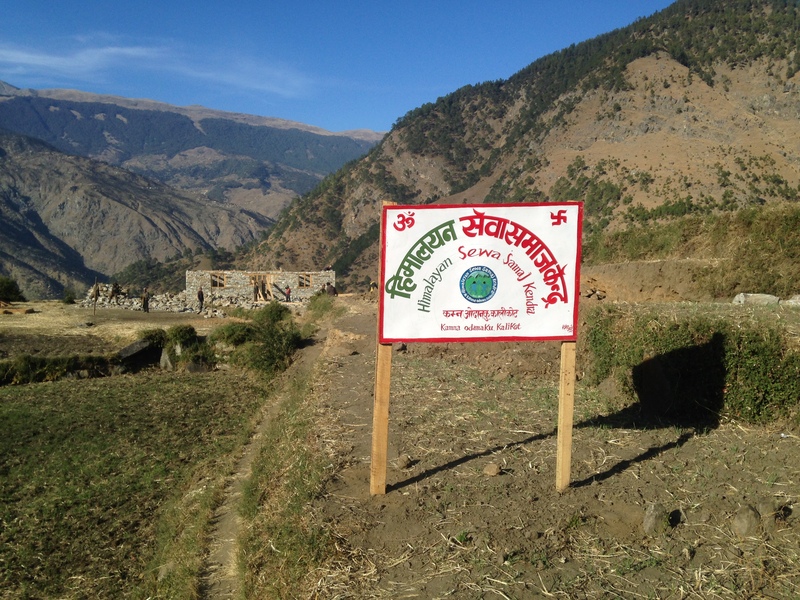 We were the beneficiaries of these recent investments on our last trip to Kalikot. For the first time in more trips up than I count we were able to make it all the way to Oda in a day...I was planning to post pictures of the road progress, but unfortunately I left my iphone cord in Oda...I will next time! Outside of the progress on the road, we have made considerable progress on our new medical building, which is the most exciting thing going on at present. 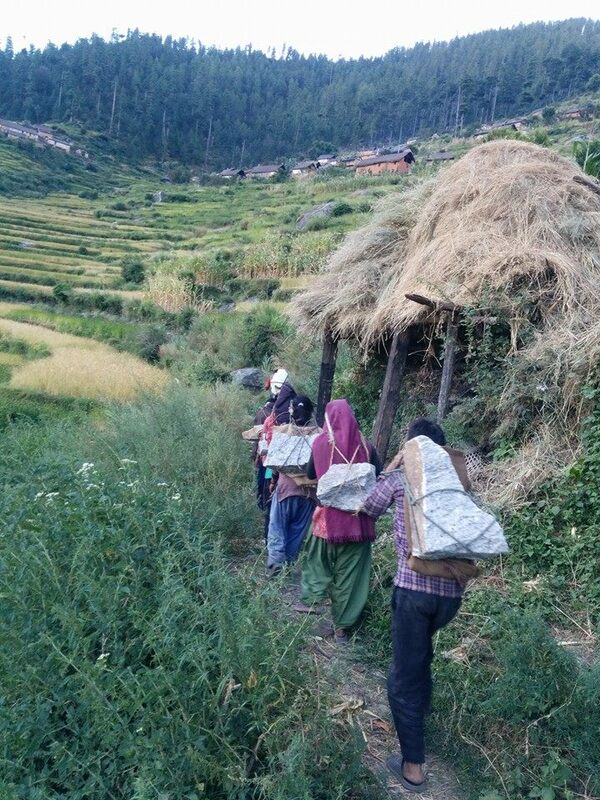 Just yesterday, I was working with about 20 people carrying stones to and from the project site. The closer the building gets to completion the more excited I am about the future of the project. The last 11 months have been great, and the headway we’ve made while living in a cowshed has been remarkable, however, there is so much more we can accomplish in our own space. 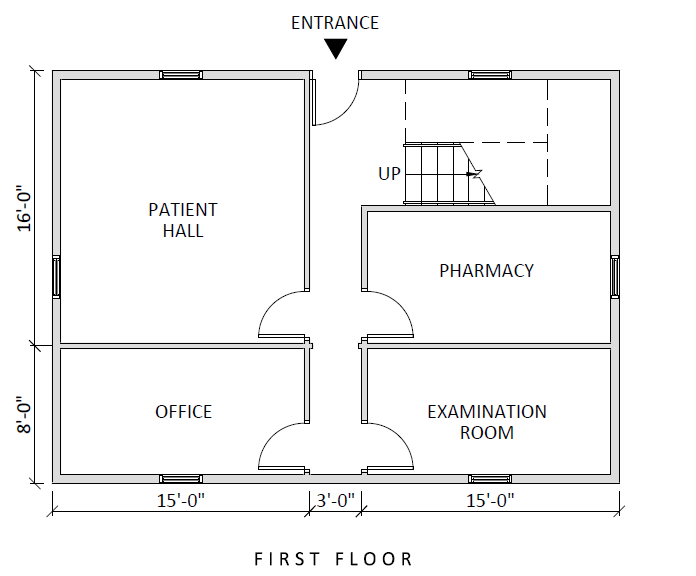 With a clinic room, pharmacy, office, and patient hall we will be able to treat more people to a higher quality. Outside of the structure, we have started to train our staff on best practices which will help put them in the position to succeed for years to come. One example of this is data collection, which we are starting to digitize. In order to do this, we’re training three staff members in basic computing and data entry. The excitement surrounding computers is great, and we’ve had several staff members staying up well past office hours, working through Mavis Beacon. Additionally, we are also planning to build a small outdoor learning space to help facilitate English classes in the community. One of the challenges we’ve faced while working in the government schools, is sporadic attendance by some of the students. As a result of this the punctual students are forced to rehash lessons, as the more inconsistent students come and go. Since we do not have authority at the government schools, we are somewhat powerless in these situations. 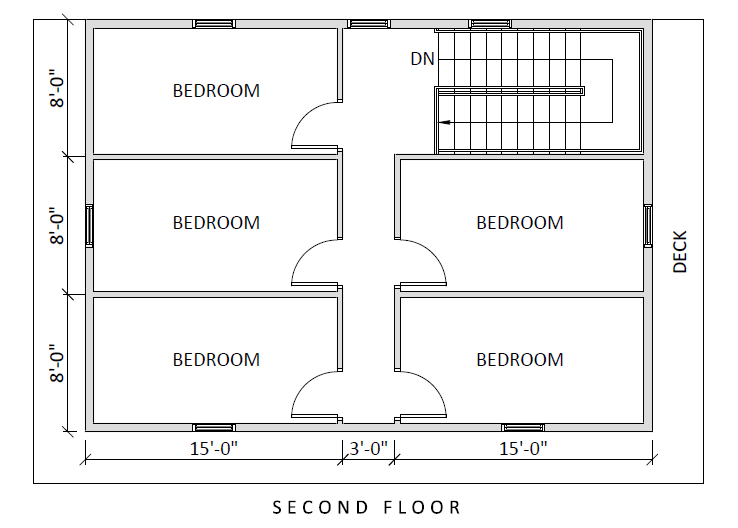 With the construction of our new “tuition” space, we will be able to have complete control over pupils and curriculum. Anyone interested in a recent piece published in Fort Lauderdale's Venice Magazine please check out the link below!!! Hi everyone. I just got to Manma, which is no easy feat during the monsoon season. Yesterday I walked 3 and half hours to the doctor’s house in Pili. This morning I got up bright and early and walked another 4 hours to Manma. It’s been about 25 days without internet so I figured it was time to check in with the world. As was the case last year, the lack of outside contact can be immensely challenging at times. While I’ve had time to think, work, and read I find myself missing the news, incoming phone calls, and ESPN. I’ve done my best to call people where I can, but do to the rains and spotty service it’s been difficult recently. On a side note, (related to the rain) I’m sending all my best to the people of Surkhet who are experiencing terrible floods. 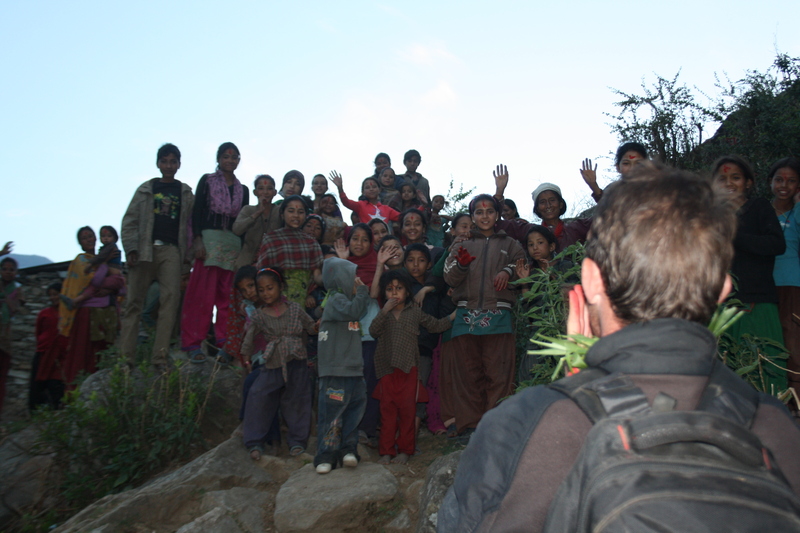 Most of the people reading this know that I spent time working in Surkhet two years ago. The recent news of yet to be identified death tolls and property damage has been hard to stomach. 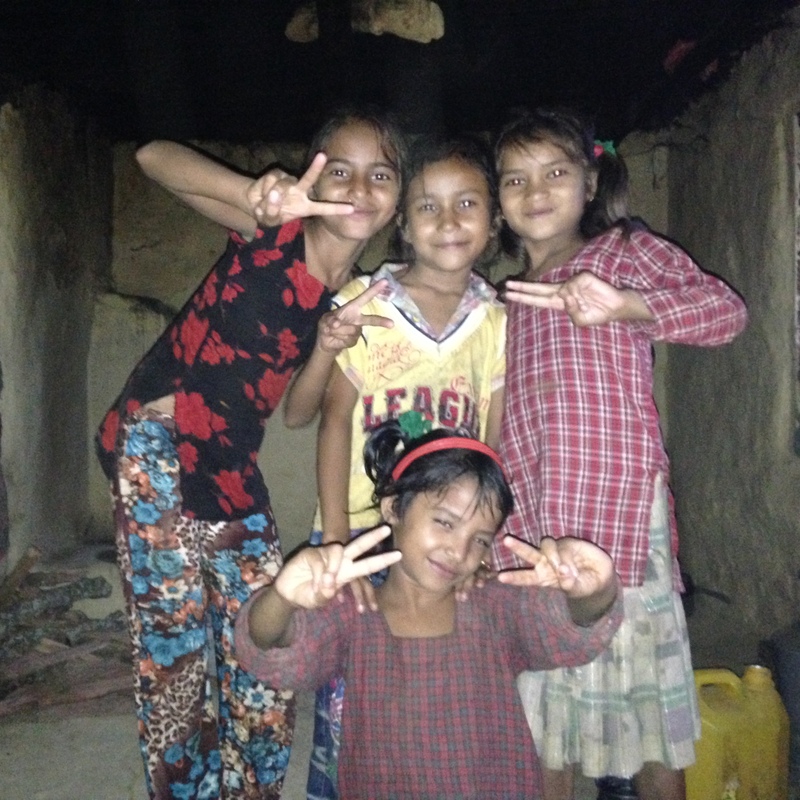 I was recently talking to a friend who works in Surkhet, and I find it hard to believe that they are only 100 miles away….sometimes it feels like we live in different worlds. As for Oda, things are moving along pretty much as I expected they would. The journey here was a challenge, and it to round out my last post it ended up taking three days. 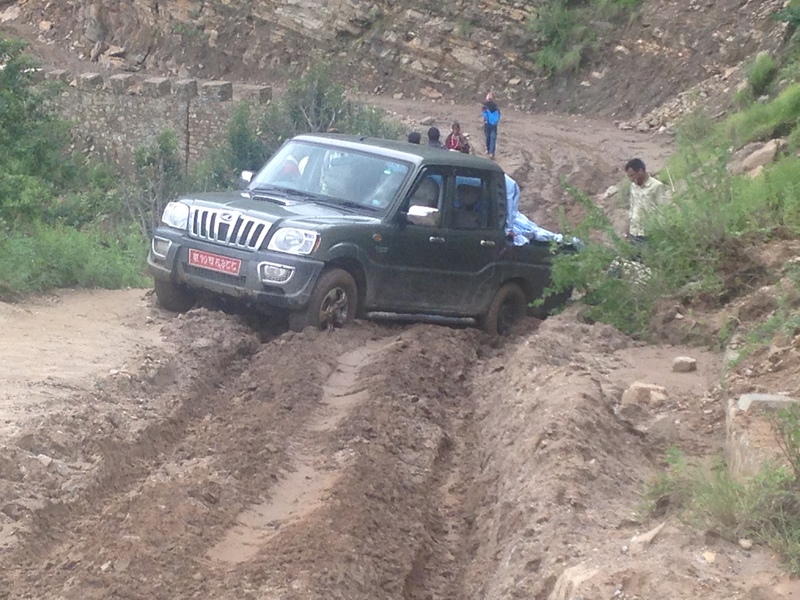 On day one we managed to snake our way through the mountains to Manma. 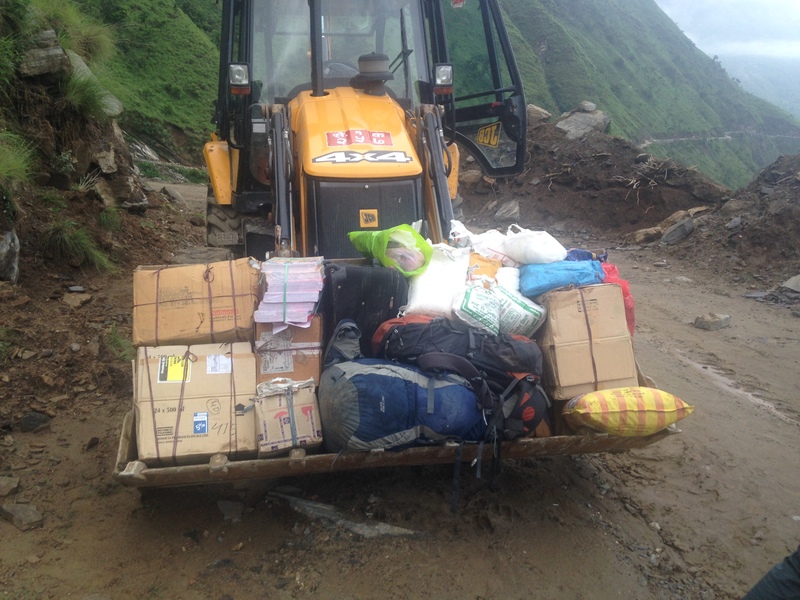 Rains and road closures prevented our passage to Sarabara (the nearest roadside village) and on the second day we enlisted the help of a dozer to get our supplies to from where the car go stuck to the doctors home in Pili. From there people from Oda met us, and carried our supplies the three hours to the clinic and home. Upon arriving in Oda I was greeted with a very warm welcome…and strangely it had felt like I never left at all. In previous visits, I feel like there has been a “warm up period”. By that I mean, a couple of days of feeling each other out before falling back to where we were. That was not the case when I got back this time, and we really hit the ground running. I think all the time sitting in Surkhet helped, and by the time I reached Oda I had re adjusted to life in Nepal and was ready to get back to work. After a few days of making the rounds, and getting up to speed on some minor changes to the clinic I quickly got back into the routine of teaching. Unlike my last extended stay, I am alone now which makes things a bit more complicated. Initially I was teaching at the top school, and tutoring the down school kids in the afternoon…a schedule I liked. 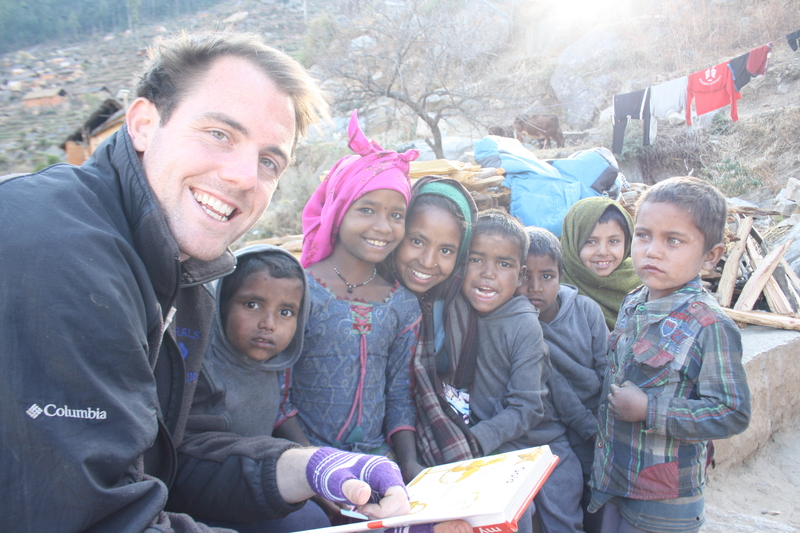 Unfortunately, that schedule did not work out for everybody and in order to accommodate caste and political tensions I’m currently splitting my time, spend three days a week at each school. In the evenings I teach the High School kids from 5:00 to 6:30. They walk an hour and a half to school, so since I am unable to spend time with them during the days, I do my best to see them after school. Outside of the aforementioned headaches, I am really excited by the progress that has been made with regards to education and more specifically English. While we are still in the nascent stages of our program, while walking around the community you can see the cogs turning in the children’s minds, as they attempt to put together a proper response when I ask them a question in English. Their desire and enthusiasm for leaning is contagious and the day really flies when I’m at the school. A day does not go by where I wish I had a few more hours to give to them to help satiate their curiosity. As for some of other updates, we’ve established a relationship with several of OdaNaku’s Female Community Health Volunteers (FCHV’s) and the recently constructed ADRA birthing center to help with the distribution of birthing kits. It turns out two of them are on our village board, and have been very receptive. 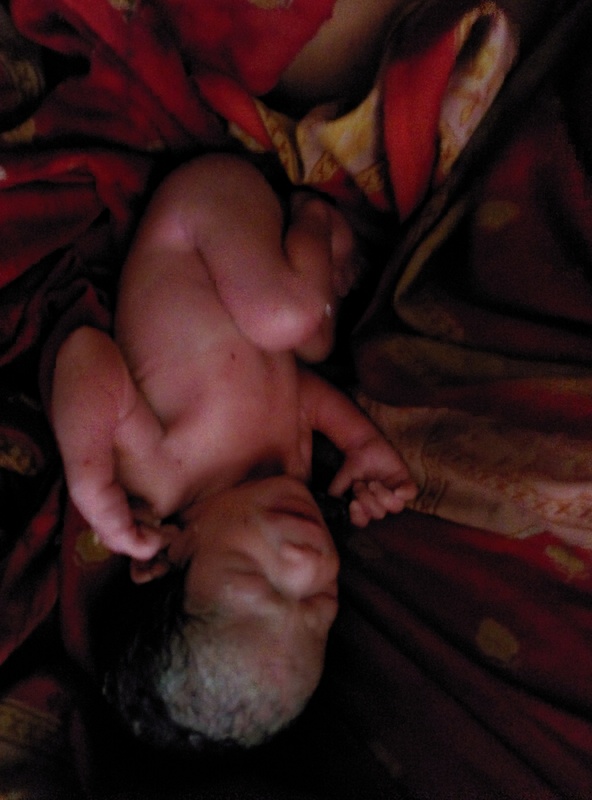 Just the other day, the first baby was born with the help of the supplies provided by the Love A Momma community. I look forward to providing more updates with regards to our efforts to supplement and improve maternal and neonatal care in OdaNaku and the surrounding VDC’s. 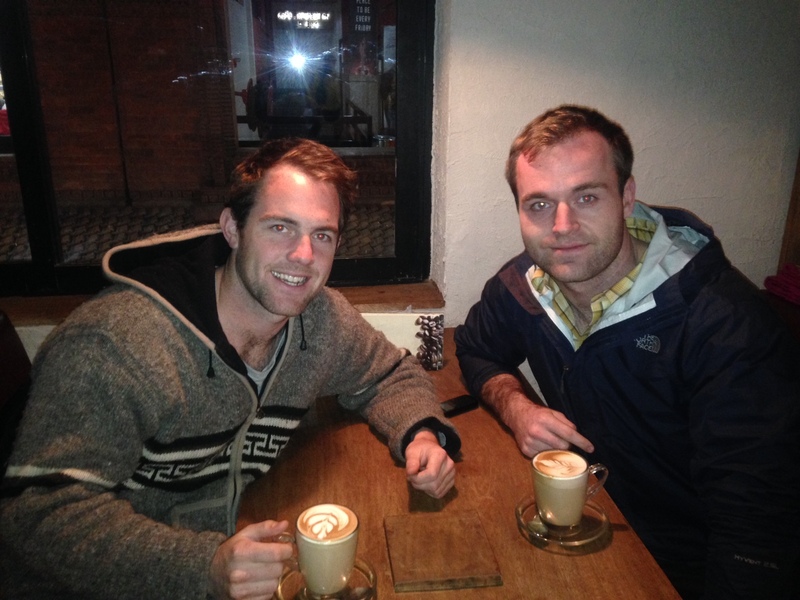 The lack of outsiders has also been really helpful with regards to studying Nepali. Rather than spending the mornings chatting I’ve been drinking my coffee and putting a couple of hours of work in on a daily basis. While I still have lots to learn, and the lack of formal classes has been difficult I’m optimistic about the progress I’ll can make before heading back to the states at the end of October. 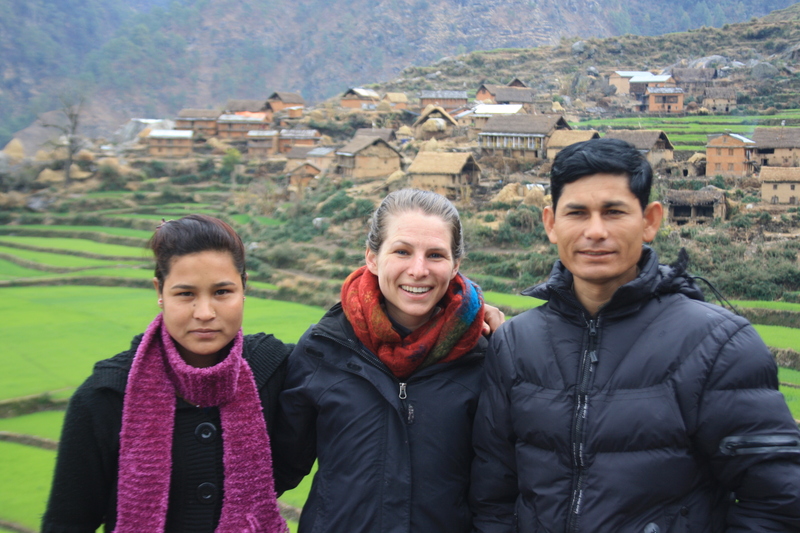 As you would expect the uptick in Nepali proficiency has enabled me to deepen my relationships with the community members, and as the language barrier continues to fall I’m excited for these relationships to expand. Looking forward I’m very excited for the next 5 weeks. Karan gets back in roughly two weeks, which coincides with the end of monsoon. 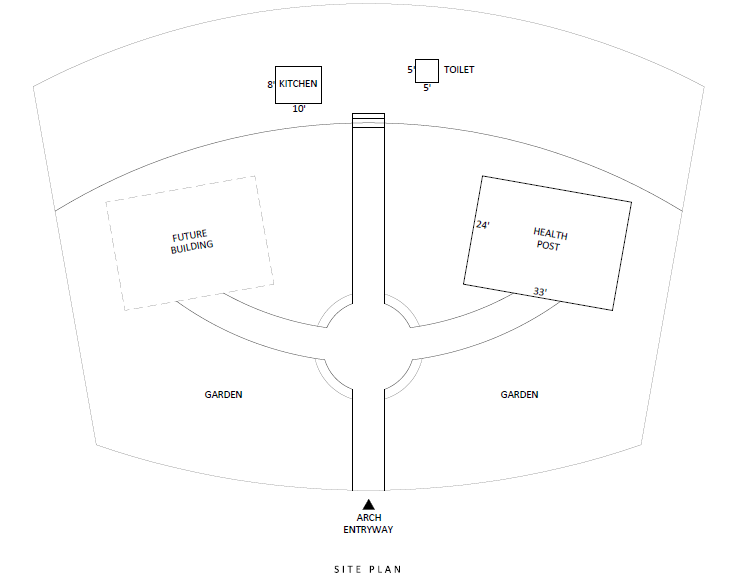 With his return, we plan to start developing a site specifically for the Foundation outside of our current home. The importance of this development cannot be understated. 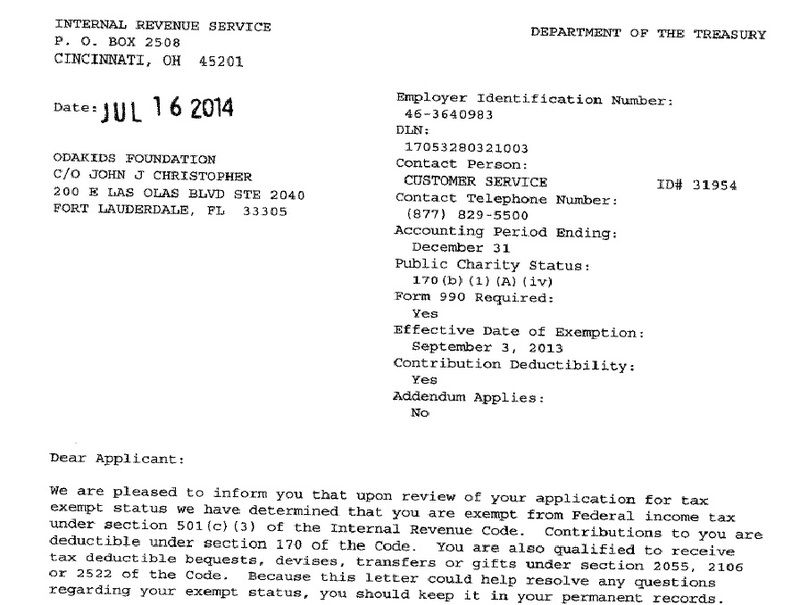 There is still a lot we need to work out, but I will be able to provide much more information in my next post. Hi Everyone, I had a moment, and wanted to thank everyone who helped out with our Washington, D.C. Fundraiser last week. It was a huge success, and lots of old and new faces were in attendance. 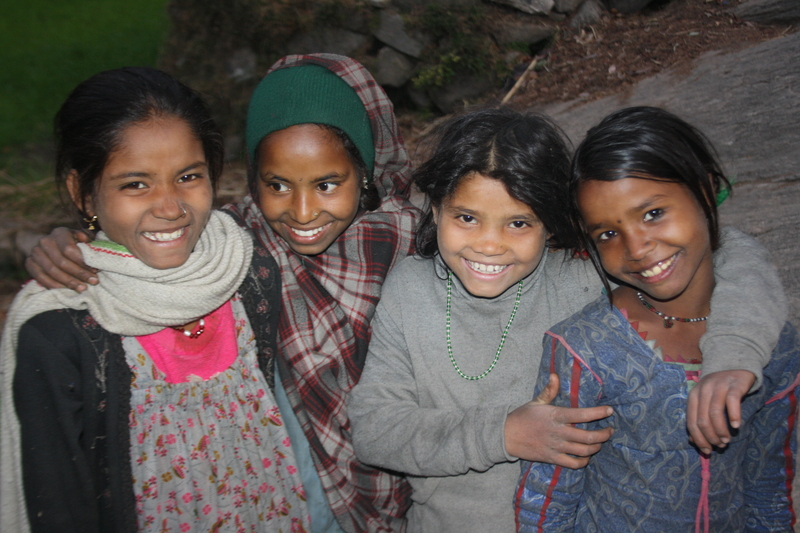 One of the highlights of the evening was seeing so many friends I met in Nepal. I’ve met some really wonderful people there over the last couple of years, and it was so nice to see everyone at the event. I also wanted to give a special shout out to Anne Porter for being such an incredible supporter. Without her efforts the night would have been a struggle, but her energy and enthusiasm were invaluable! Beyond catching up with friends, the programs highlight was Karan’s speech where he discussed his story and his involvement with the Foundation. Despite his initial nerves, his talk was outstanding and as someone who grew up in Oda, his unique, insightful, and heartfelt talk made the evening special for all those who attended. More updates soon…but for those of you in Fort Lauderdale please join us this Friday night downtown! Looking forward to seeing everyone! So it has been quite some time since I’ve written last. I was actually out to dinner last night, and one of my friends called me out on how long it’s been since my last post. She was very right, and it’s embarrassing how bad I’ve been at posting. I think the the speed of life at home, has gotten me away from putting things online. It’s been very tricky to find a balance between the foundation, working, and catching up with friends and family! A week after returning to the I started work at my old consulting firm, which has been a huge blessing, enabling me to live a semblance of the life I had while I was in the US! 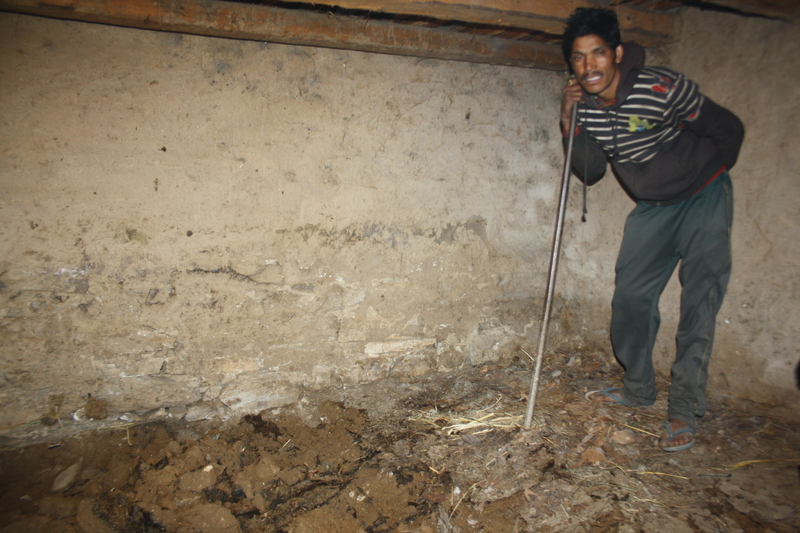 I’ve also been working to get the Foundation in a good place before I return to Nepal. We are working on a new website, a new logo, fundraising plans, business plans, fundraisers, and everything in between…that is another one where I’ve been extremely lucky to be surrounded by a great board, group of friends, and supporters willing to help pick things up where I am slacking. Most importantly, since I’ve been home I’ve been able to catch up with lots of friends and family and attend lots of wedding including: Kirk and Tee, Pat & Lindsay, Alex & Amanda, and Hagood & Whitney. As fun as those adventures have been, they've also taken their toll as I’ve spent much of the past month moving from couch to couch. Last month I thought I was going to leave my home in Fort Lauderdale for 4 days and return. As has been the case recently, the “plan” quickly diverged from reality and I’ve spent the last 3 weeks travelling around the mid-Atlantic and northeast catching up with people, while spending my days in random coffee shops working to get things done. 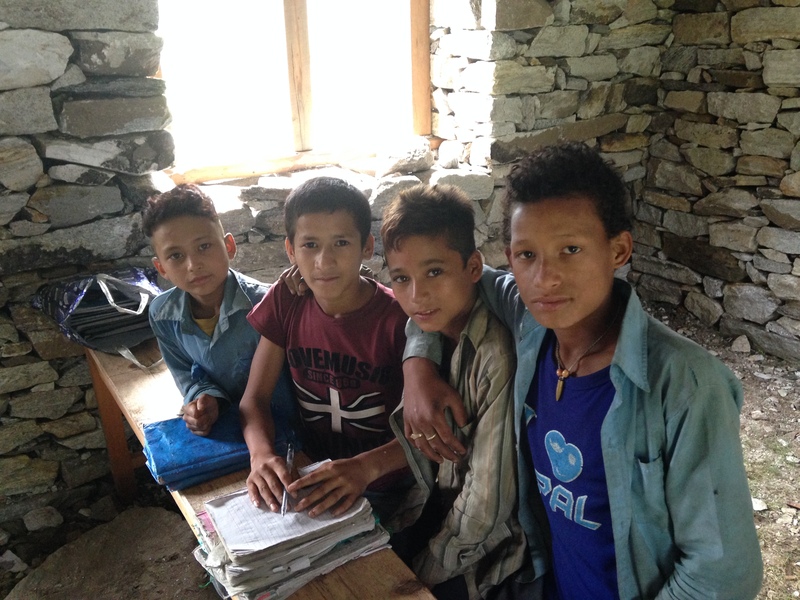 As for posting, below you’ll see a blog I wrote while in Kalikot which talks a lot about the issues we’ve run into over there with regards to education. My plan is to put stories like this on the blog far more regularly from here out! I will also post more detail about our progress this summer in my next post! Couch surfing...not always on couches this summer. One of the more challenging things about living in Oda, is reconciling the degree to which the current education system has failed many of the kids. One glaring example of this occurred one morning when Bobby and I woke to the sound of our housemate memorizing mathematical formulas. As I listened to him spit out the rules of exponents, I had a sudden glimmer of hope. For a brief moment, I imagined that while English may not be up to snuff around here, he might be a math wiz in the making. After hearing a few more rounds of formula’s Bobby and I called him over in to see exactly what he was doing and try to help out. He certainly needed some help, and while I did my best to recall exponent rules Bobby did a quick math warm up. Unfortunately, we quickly learned the reality of the situation. Bobby scrawled out a few problems including: 10 + 7, 3-2, and 10/5. To our dismay those problems were met with a blank stare, and an exclamation that those problems were much too challenging. At that point Bobby began working through basic addition and subtraction. Unfortunately, our friend wanted to progress to the rules of exponents, not knowing that without the building blocks of addition, subtraction, multiplication, and division, virtually everything would seem like gibberish. Whether dealing with math our English, it is quite common to see an enormous disconnect between curriculum and actual knowledge. Unfortunately, the government curriculum plows ahead regardless of comprehension. That means, that whether or not a child grasps the lessons they go ahead and advance through the school. Bobby and I have done our best to tread lightly while dealing with this situation, working to build foundation math and English skills, while not destroying their confidence in the process. This has proved challenging at times, knowing that a quiz was about to be given on exponents or other sorts of algebraic expressions, while knowing fully that many of these children have not moved beyond simple arithmetic. 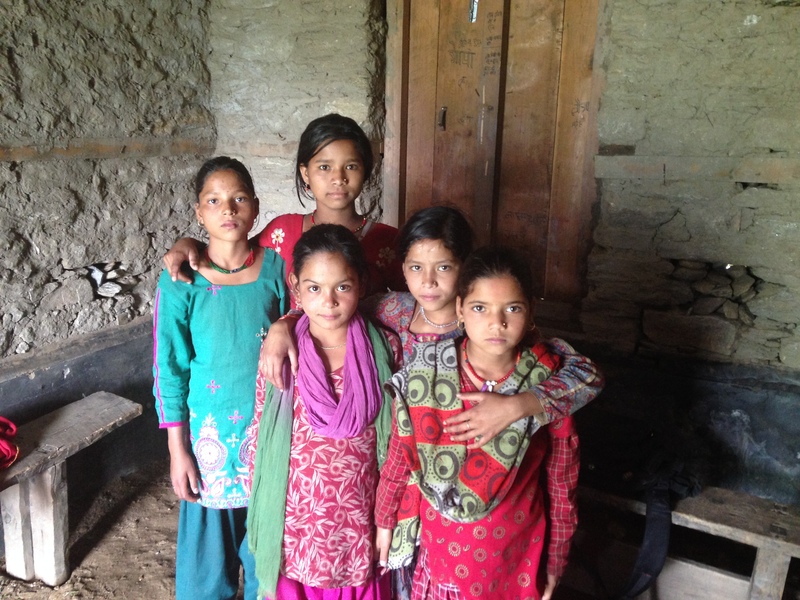 Some of the Pariyar girls! 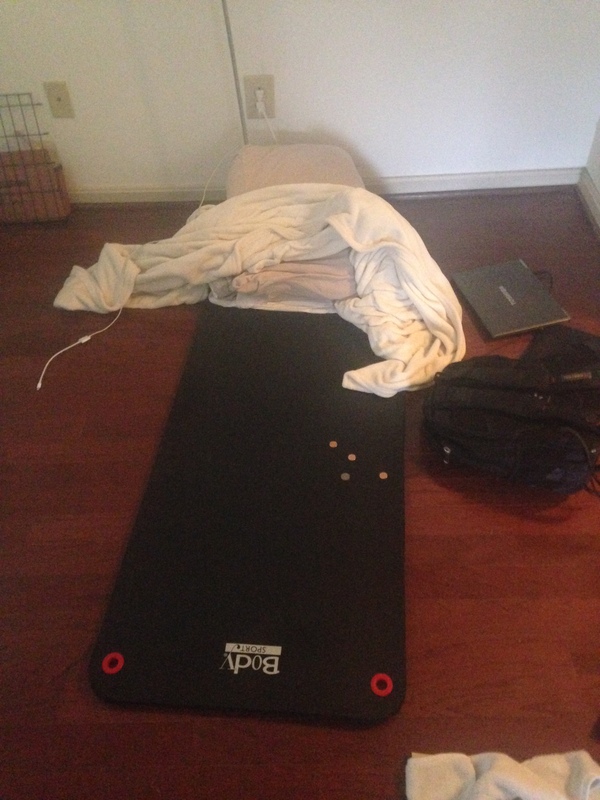 The following is a blog post from Cara Skillingstead! She was an amazing help out in Oda, her thoughtfulness, work ethic, and open mindedness were admirable. Between Cara and Bobby, we had a wonderful team in place that helped craft and articulate ideas for the future of the project. Can’t say enough amazing things about Cara! I have my fingers crossed that she will be returning to Nepal in the winter of 2015!!! Here are Cara’s thoughts on the importance of cultural competence and our roll in Oda. The past month has been a true test of our abilities to exercise cultural competence. There are days working at the school where it is difficult to understand whether or not Nepali culture truly values education. Certain days at tuition, we find ourselves toeing the line between frustration and agony as we desperately try to discern our roles as disciplinarians in a place where discipline does not exist. At times in the clinic, I find myself cringing at the amounts of completely avoidable ailments occur here because of a lack of education. This has been a tremendous growth experience, for ourselves as well as for the foundation. Not only have we discovered various cultural idiosyncrasies, we have also been able to conduct a rather comprehensive needs assessment of the community. Our (somewhat futile) attempts at English classes in the schools have reinforced the realization that this area is in desperate need of consistency in the education system. Disciplinary issues during tuition have unveiled some deep-rooted social dynamics between members of different social standings. The clinic shows promise for the future health of the community by providing medicine and care to those in need while also collecting data to support future ODA endeavors. This has certainly been an eye-opening trip for us all, not only for the sake of the project, but for our own understanding of Nepali culture. Sorry for the delay since I last contacted. 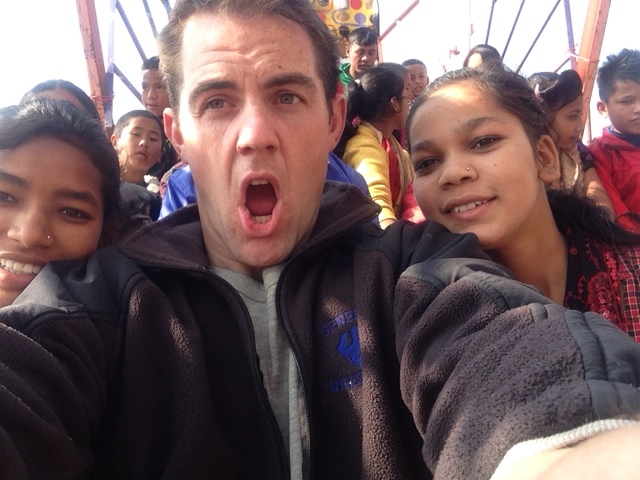 The last few days in Kathmandu have been very surreal. Whether saying goodbye to Bobby and Cara who were so helpful during the past two months, to catching my breath and reflecting on my time in Oda, it’s been rather interesting. In many ways I feel like I’ve been in a limbo of sorts, with one foot out the door, excited to return home to my friends and family but sad to have left behind my friends and family in Kalikot and Surkhet. Thankfully, I am leaving Limbo soon to make the very long journey home. I will be in India today, and Saudi Arabia tomorrow but on Wednesday I am landing in DC and couldn’t be more excited! While, I’m still processing much of the ups and downs of my last trip, I wanted to pass along a few updates prior to heading to the airport! Things are going well with our existing projects, particularly with our health clinic which has treated over 2,300 individuals since December 12th. These patients come in with a wide range of issues with the most common illnesses being; pneumonia, typhoid, Chronic Obstructive Pulmonary Disease , diarrhea, and jaundice. In my final meeting with the community, several elders were emotional, explaining that this year there was one death in the community that could not be attributed to age or some sort of chronic condition which contrasts sharply to the historical average of 30 to 40 individuals per year. As you can appreciate, detailed records are sparse in this part of the world so unfortunately this anecdotal evidence is all we have to go on at this point. While I cannot say with certainty that the clinic was responsible for this change, I am very proud of what has been accomplished and the positive impact the clinic is having in the community. Beyond treating sick patients, the contribution of reusable maxi pads was also an enormous success. By all accounts, school attendance amongst the community’s girls was up significantly with girls growing more comfortable and confident with the pads. We are hoping to quantify this going forward so we can track our progress. Outside of medicine we’ve been working extensively in the government schools, evaluating shortcomings and learning what we can do going forward with regards to curriculum. Our presence at the school has boosted school attendance tremendously and the kids are starving for information and quality teaching. This sad reality stems from the highly unionized government schools, where teachers have no incentive to work hard or even teach students. Slowly, attitudes are changing amongst some of the teachers, and I am very optimistic about future strides. I have so much more to update on, but I wanted to pass along some brief highlights!!! Thanks so much for all of the support, looking forward to posting more updates and stories soon. See everyone soooon! Hope things are well back at home! The past ten days have been a blessing, as we’ve been so lucky to have Doctor Kendall visit us in Oda! As I mentioned in my last post, Kendall is in the home stretch of medical school, and will soon find out where she will begin her pediatric surgery residency! Kendall’s upbeat and positive attitude towards her trip cannot be understated, and she proved to be an invaluable asset to our constantly evolving medical program. 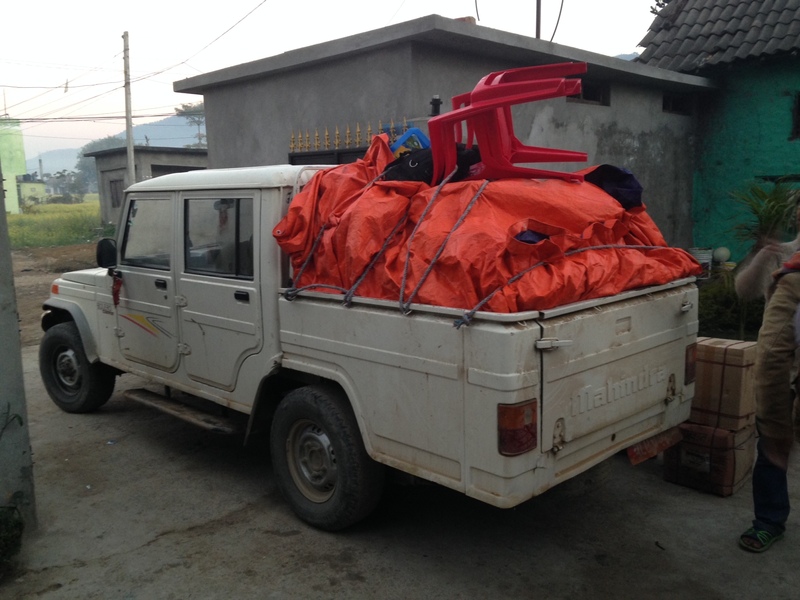 As Kendall and I joked about, when you reach Oda you are living in “Nepal Heavy”. What does this mean? Squatting toilets, a discernable lack of English speaking, no power, no internet, limited phone service, and one heck of a car ride are the challenges one must face during their time here. That being said, her ability to adapt, thrive in, and embrace her short time here was “SUPER” impressive. 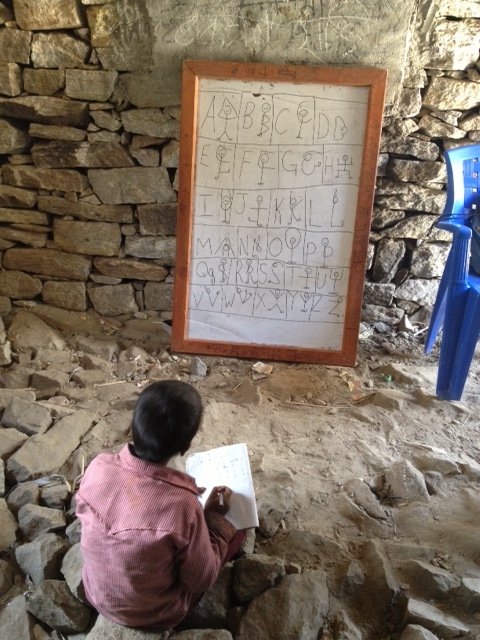 Enormous strides are being made in our English tuition program here in Oda. The children, Nepali staff, and community are consistently eager to demonstrate the new and fun things they’ve been learning to each other and to our new volunteers. Many a night during Kendall’s visit (after her challenging days in the clinic!) were spent warming our hands over the fire and talking about what was learned in class today. Just as the children and staff can never get enough English, Kendall too spent her free time fully immersed in Nepali Language Learning. As an aside, in an effort to illustrate the difficulties of the Oda medical landscape, the day before Kendall left we had a very unfortunate incident take place. Our medical staff (Doctorji, his apprentice Sarita, and Kendall) received word that a new baby was being born just a few houses away from us! Immediately Bobby, myself, and a number of the kids broke into dance and starting chanting “Naya manche! Naya manche! (New person! New person! )” as our medical team set off. As we awaited their return, a number of us began to speculate how long the birthing would take. It can be a very long process in the states, so we were preparing for a long evening of eager anticipation. Approximately 45 minutes later though, Kendall returned with the doctor and we immediately sensed something was wrong. Doctorji (who is usually full of smiles), had a somber look on his face, as Kendall broke the news to us that the baby had passed away during birth. This was my first exposure to death at such a young age. While I’ve heard about “high infant mortality rates”, not until that afternoon did it hit so close to home. The combination of sadness in conjunction with relief (the mother survived), was a lot to take in. In many ways the outcome was extremely positive, the mother will be able to carry more children and live a full life thanks to the contributions of Kendall and Doctor Karki. I will update more soon! Sorry for the somber conclusion but in a bit of positive news, one of my favorite people in the whole world will arrive in Kalikot next week! Cara Skillingstead (sister of one of my other favorite people!) will be arriving for a one month stay in Oda later this week! In another bit of news, I’m hoping to have Kendall post a firsthand account of her experience soon! Miss you all love you all! I am back in Surkhet for a quick couple do days before heading back to Kalikot! 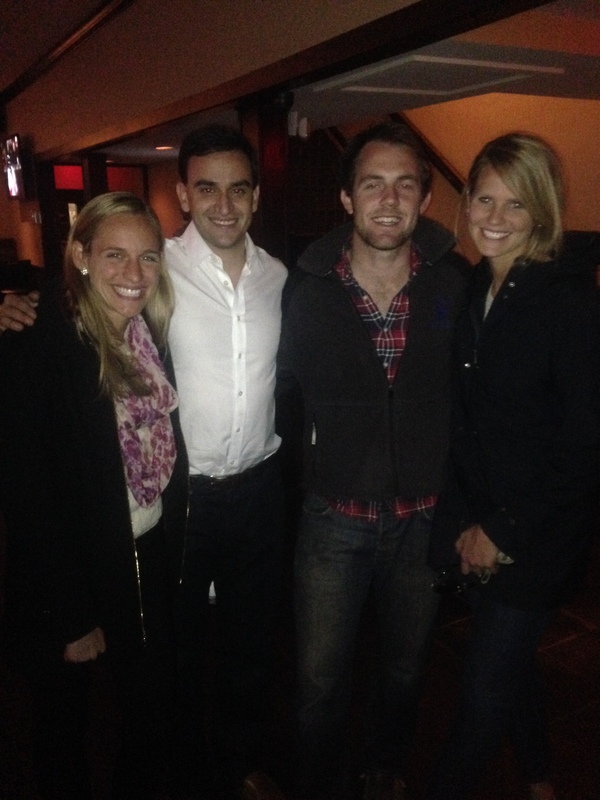 The reason for this exciting albeit very surprising trip is because we have a special guest Kendall Massengill! Kendall went to Washington and Lee with me and just concluded Medical School at Wake Forest. Before spending the next seven years in her Pediatric Surgery residency, Kendall had a trip planned to head to Angola to help a local surgeon. Unfortunately (fortunately for us), her visa situation did not work out due to turmoil in the Angolian government. That visa fiasco resulted in a conversation with Kendal about one week ago, where she asked if she could come and work in our clinic for 3 weeks. Of course my answer was an ecstatic YES! While Kendall likely won’t be performing any surgeries like she would of in Angola, we are thrilled that she is here. Both Doctor Karki & Sarita (our doctor’s assistant) are extremely enthusiastic, and excited to pick Kendall’s brain on a range of topics. Kendall is also excited to learn from our team. I will report back on this experiment in a couple of weeks, but I am beyond excited and feel extremely blessed to have Kendall helping out. Outside of the clinic, things are going very well up there. Bobby has been a Godsend, and I can’t say enough good things about all of the work he has been doing. Every morning he wakes up and diligently studies Nepal for two hours, followed by an hour or two of class planning, followed by an afternoon of language teaching. Beyond these contributions he has been an amazing sounding board, helping me develop my thoughts and ideas for the future of the project. His thoughtful and sincere responses are invaluable, and I’m so lucky to have him by my side up there. As for me, I am happy as ever. While I enjoy my trips down to Surkhet…seeing friends, using the internet, and eating good food its getting increasing challenging to leave Oda. With every trip my relationships continue to grow deeper and more genuine with the people I am working with. Our team in addition to the communities is incredible and while I’ve had my share of headaches as a result of language issues, for the most part things are running well. In many ways the miscommunications I’m experiencing now, are beneficial, as I slowly but surely improve my Nepali language skills. I leave in the morning, but I will do my best to throw up another quick post before I leave! I hope everyone is surviving polar vortexes and snowpocalpyses. The last few weeks have been a great adventure with lots of accomplishments, and progress. That said, it is those two realities that are top of mind right now. We were so lucky to have Safira visit us for a week. Her positive attitude and genuine desire to help was immediately appreciated by our team in Oda along with the community at large. Whether it was Nena’s visit 3 months ago or Safira’s visit last week I am so fortunate to have such incredible people in my life, people that will jump in a shaky jeep or a bus for 12 hours to help the project. Her return to America was certainly a sad day, but much of the sadness was alleviated by the arrival of Bobby! 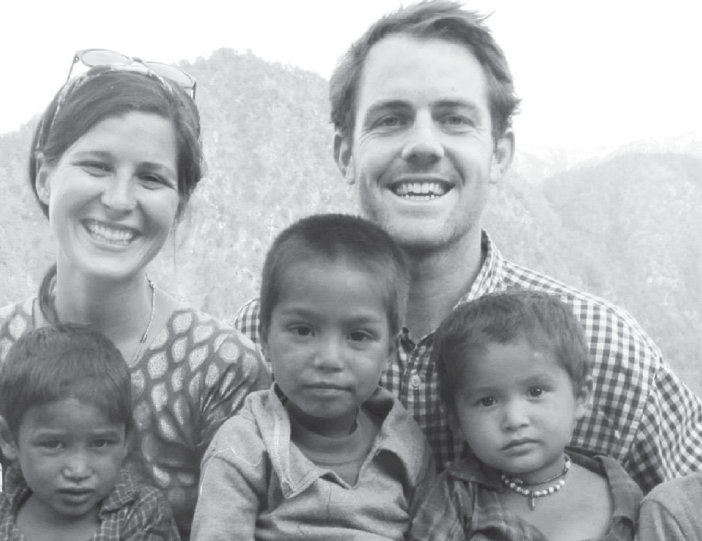 Bob’s is making his second appearance in Nepal, and I’m so excited for him to jump in and begin making a difference. His laid back attitude, level head, and positive demeanor are exactly what I need right now. 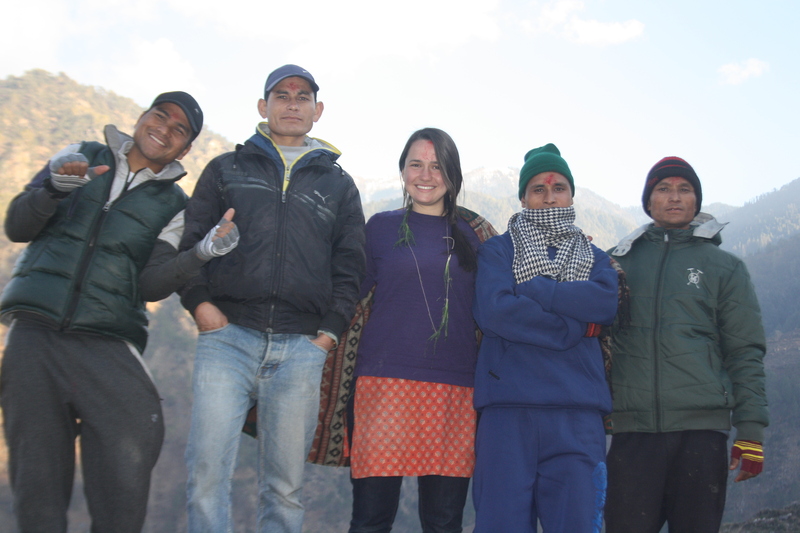 Safira with our Nepali Staff! 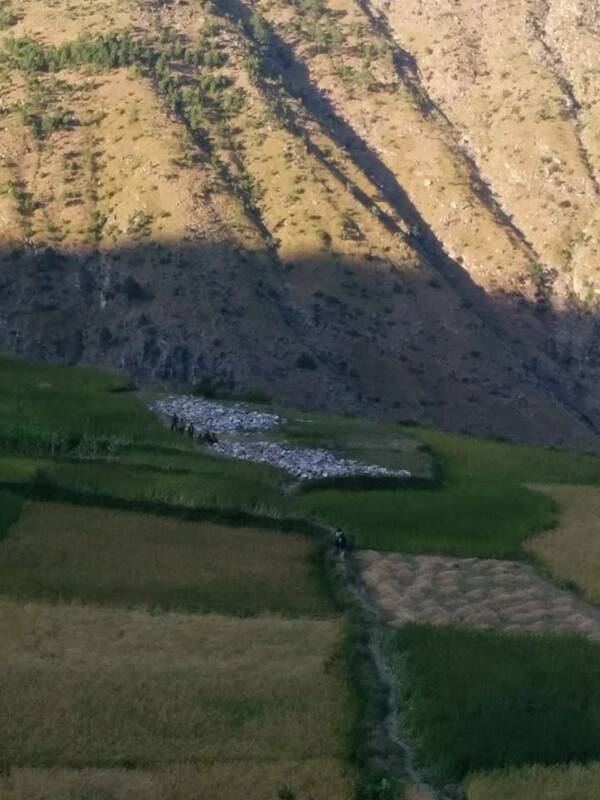 My last journey to Kalikot was a tremendous success. I was joined by my great friend Safira Amsili, who worked tirelessly in our clinic and with our kids during her week in Oda. Thanks to Safira’s efforts and the generosity of Cara Valentino, Magdalena Long, and the Kopila Valley Woman’s Center we were able to provide reusable maxi pads to sixty girls in the local community. Initially we were concerned about how these efforts would be received, as the girls off Oda are very shy. As it turns out they were ECSTATIC! Before our arrival girls would skip school for five days a month, rather than deal with potential embarrassment, something we were able to alleviate with our dissemination of the reusable Pads. While Safira is gone, we have another tremendous female volunteer coming next month (Cara Skillingstead), who will work with our girls in order to see what is working well and what is not! A snow fall which led to the most fun day ever! Safira and I woke up early to the sound of my partner Karan going CRAZY with excitement. He left Oda as a boy, and hasn’t seen the snow fall in his village for a very long time. His excitement was palpable and rubbed off on Safira and I who engaged in a snow day for the ages. We built two snowmen, and one snow woman, had relay races, took tons of photos, and enjoyed a day I will not soon forget. The next day we left Oda, which was harder than usual. Each time I go up, I fall more in love with the community, the kids, and the adults. 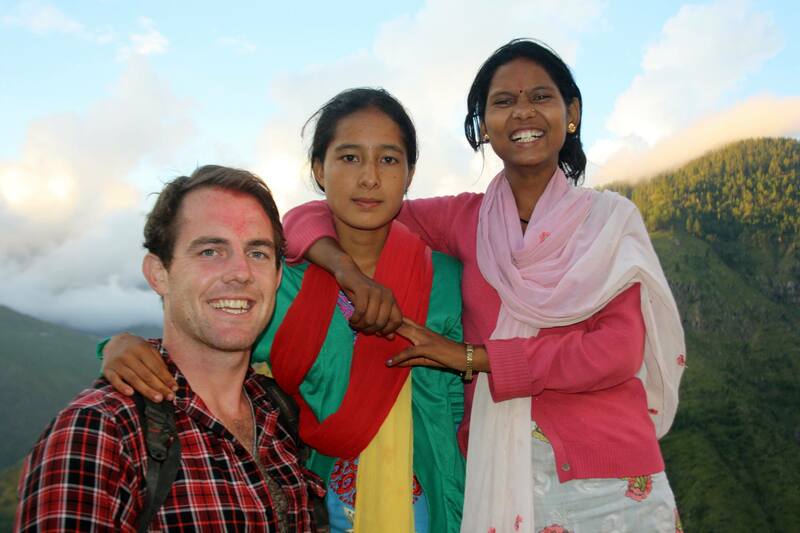 This trip was made even more special by Safira’s visit…and we are very eager for her hopeful return! During the next few months, we plan to focus largely on the programs we have in place. 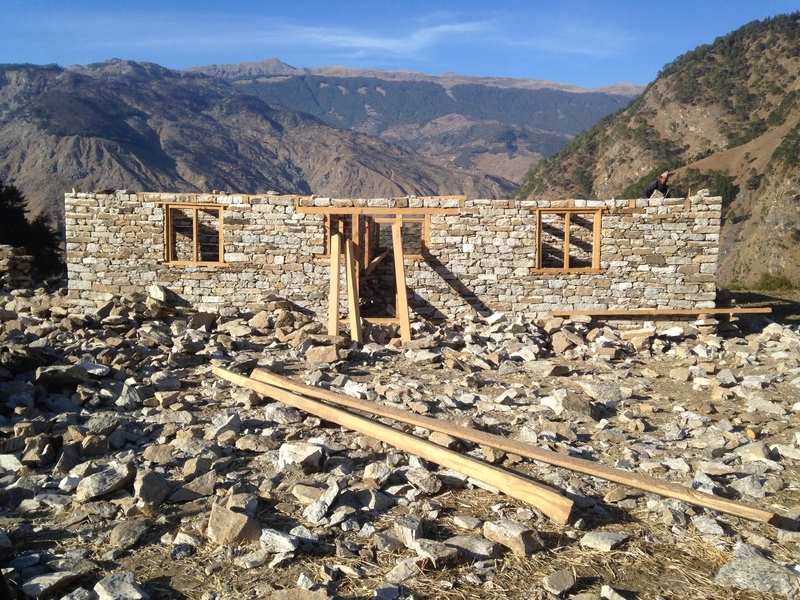 Karan and our team in Kalikot recently built a new room for sick patients to receive treatment if they are unable to return home. 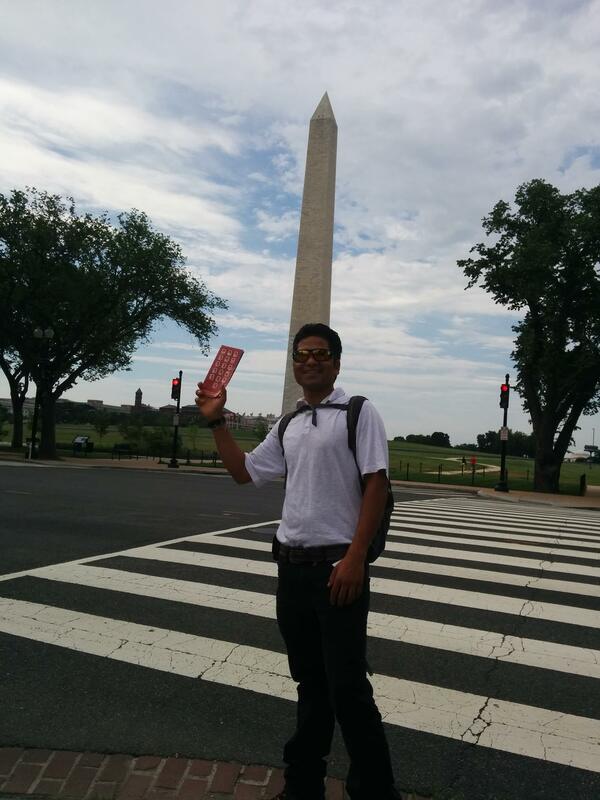 Further, Bobby’s arrival will be a tremendous boon to our tuition program. He will be at the project for almost three months, which will be amazing in terms of providing continuity and direction to our tuition program! Beyond that, I plan to spend the majority of the next three months in Oda as well…with the exception of a quick trip down in March to receive Cara and purchase some additional medicine! During these months, I hope to work diligently on my Nepali. With each trip I learn more and more, however, 3 months of immersion should go a long way in terms of bringing my language skills to the next level! Happy 2014! Happy 2014 everyone! I am so thankful for a wonderful 2013, a year with more than its fair shares of ups and downs. 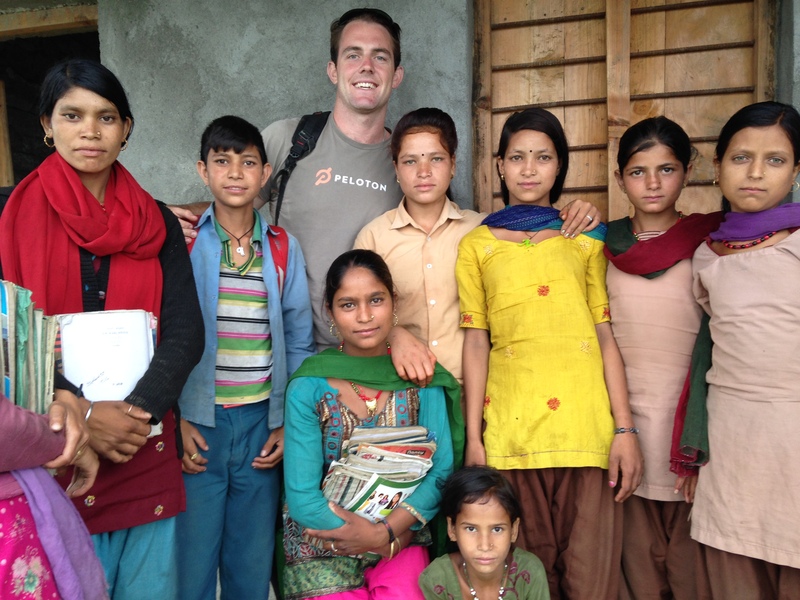 Whether I was watching friends get married, spending time with family, working with Kopila Valley, or most recently progressing with OdaKids…it was certainly a year to remember. More than anything I am thankful for the family and the friends who supported and believed in me, and what I’ve been hoping to do. As with most things worth their salt, it has not been an easy road, but a road worth taking. In our first month alone we’ve treated over 500 people, and continue to help more people daily as people learn about our clinic and our work. Happy New Years from all of us!!! As for the project things are humming along. 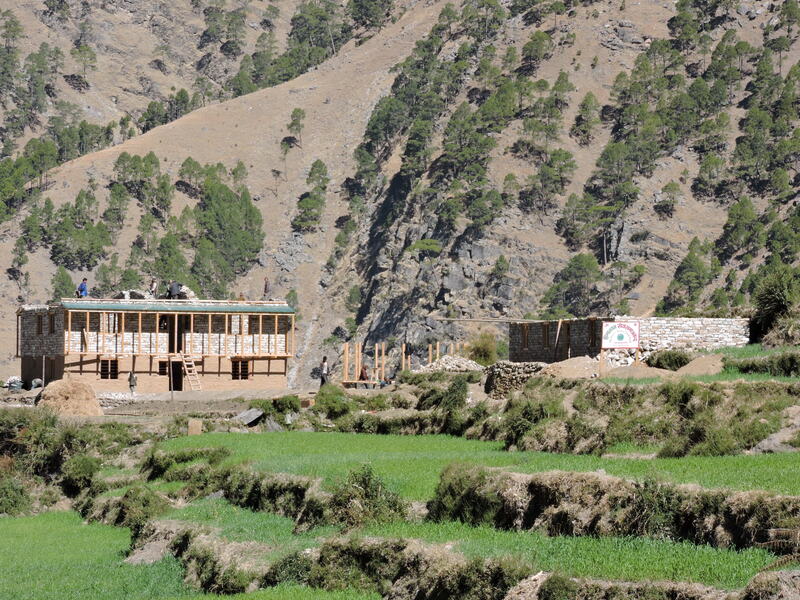 As I wrote about in my last blog post, the realities of living in Kalikot and the challenges we face are pretty intense. When we call Oda for updates, we ask for several data points, but one of the most telling is the amount of “Serious Patients” that come in. While it is wonderful to help people with a cough, a cut, or some sort of ache…it is helping these serious people that left an indelible mark with me on my last trip up. 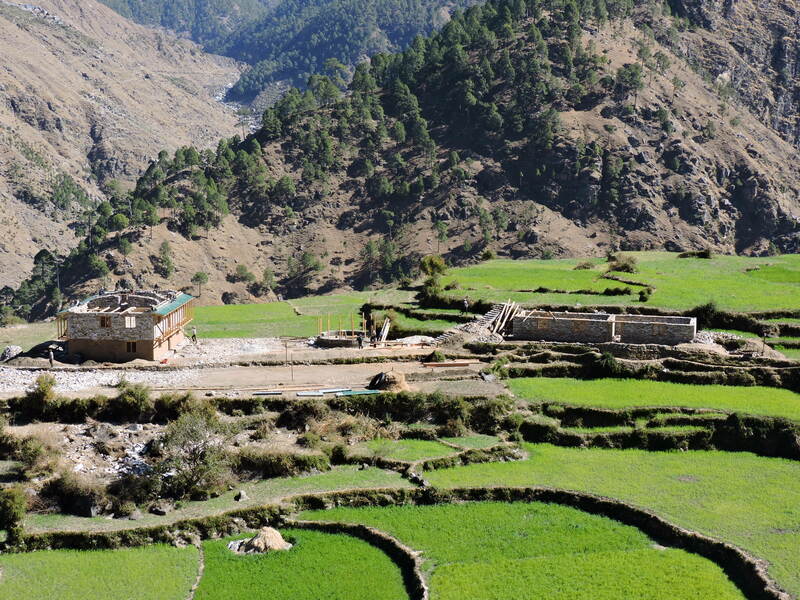 During our first two weeks in Kalikot, we saw all sorts of serious patients come in; however, two stories really stick out, one with a sad ending, the other with a much happier conclusion. The first involved a middle age woman whose husband carried her on his back for two hours to get here. Upon her arrival, I could just see in her eyes that she was in extremely bad shape. The haunting way she gazed into my eyes is something I will not soon forget. As the doctor worked with the woman and her family, I knew that her condition was serious but not quite how serious. A few hours later I realized the woman was gone; and to my surprise I discovered her husband had taken her home. I figured that despite her condition, the doctor must have given her something to help and she was back resting and recovering in her home. It was not until later in the day, that I learned that on her journey home she passed away on her husband’s back, just as they were arriving. I was tremendously sad to learn this news, however, over dinner I talked to our doctor where he said he knew instantly that the woman did not have much longer to live. She had a pneumonia which was far past the point of treatment. 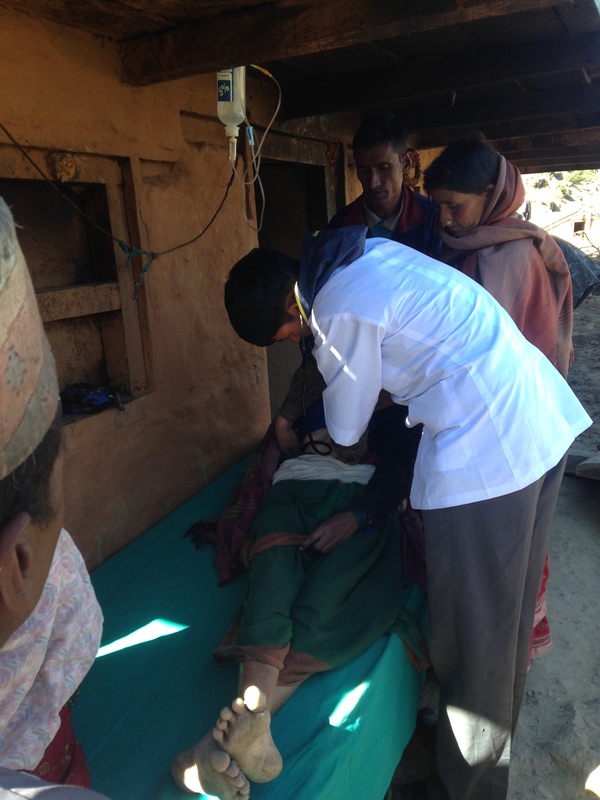 Rather than treating her, Doctor Karki gave her some medicine for the pain, and laid her in the sun, as he explained to her husband that he should enjoy the last few days and hours with his wife as she did not have too much longer to live. 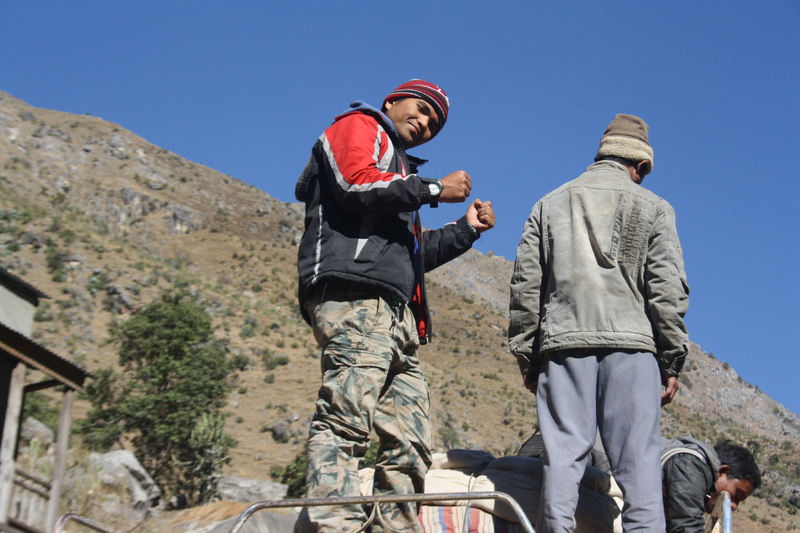 While I appreciated his honesty, it was not until that moment that I fully understood the reality of life in Kalikot, and the gravity of what we will face on a daily basis. A sad day from when our clinic was still outdoors. ON a more uplifting note, thankfully all of these stories do not have a sad ending. Two days after this woman passed away, we had another girl come into our clinic. Like many of the patients that come, she was carried on her father’s back from Romney, which is roughly an hour and a half away. When she arrived she was shaking, vomiting, and barely conscious. The Doctor quickly asked everyone to leave the clinic, and immediately hooked her up to an IV and gave her several other intravenous medications. Throughout the course of the day, I would pop in to check on her. We recently constructed a bed in the clinic, so the doctor could work, while keeping an eye on patients that need to be looked over. She was one of those cases, and for 6 hours, the doctor monitored her and replaced her IV bags. As the clinic was closing she was able to emerge on her own feet and walked home with her father. After she left the doctor explained to me that she was so dehydrated, and losing fluids so rapidly, that without immediate treatment she almost certainly would have passed away. On one hand this was satisfying knowing that our doctor was able to save this 13 year old girls life, however, it was also extremely sobering. I hate to think about all of the people that will pass away, because they cannot access the most basic medications, and can’t help but ponder the fate of this girl had she fallen ill one month earlier. That said, for this one girl Doctor Karki made a difference, and just as importantly, our supporters from home made a difference. 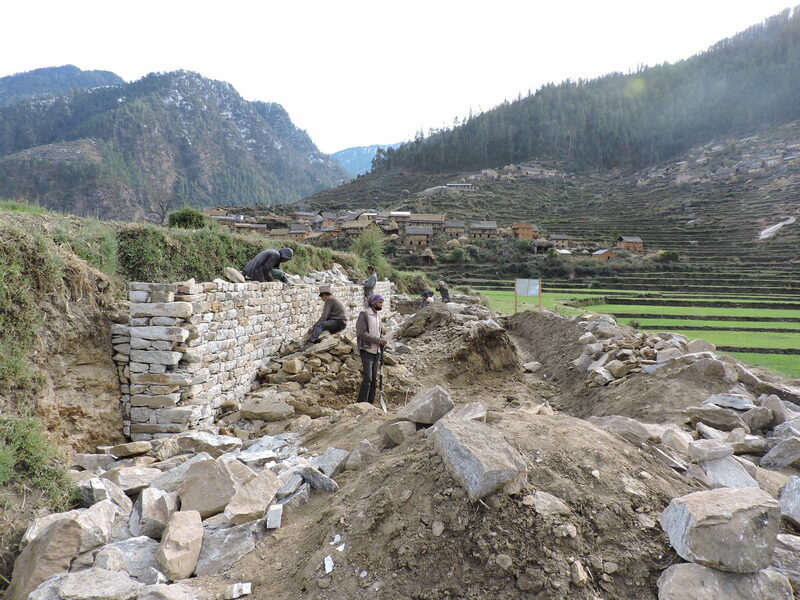 In the world and especially in Nepal and other developing countries such a limited number of time and resources can make a truly profound difference. In this instance, it was the difference of life and death and a happy ending that otherwise might not have been. A Scary start which concluded in a Happy Ending! So…with the challenges of 2013 behind us, I am thrilled for the New Year where and all of the exciting things planned for the coming weeks and months! 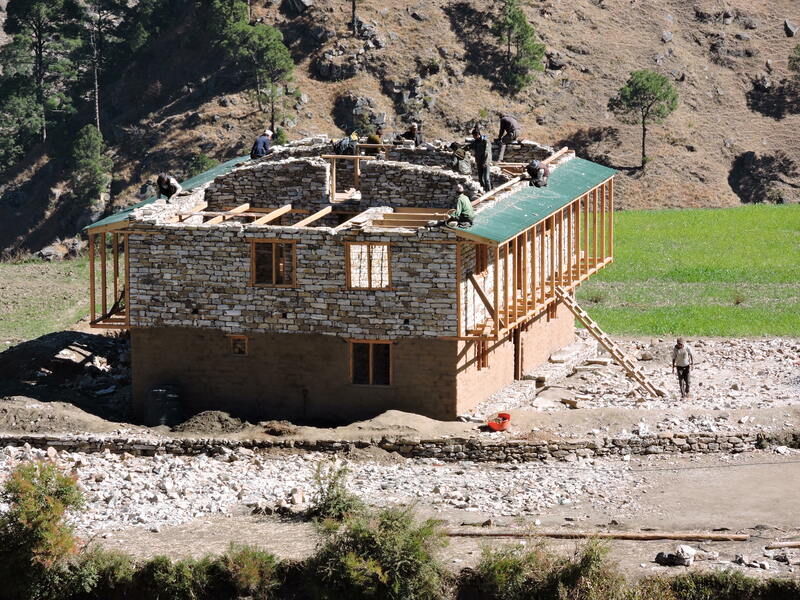 I recently got back from Kathmandu where we made some great progress for the project. I met with lots of tremendously helpful and bright people, and all of them seemed more than willing to lend a helping hand. Whether travelling to Fabric and Clothing wholesalers to medicine distributors we met with a lot of people who can help now, or have the potential to help in the future. 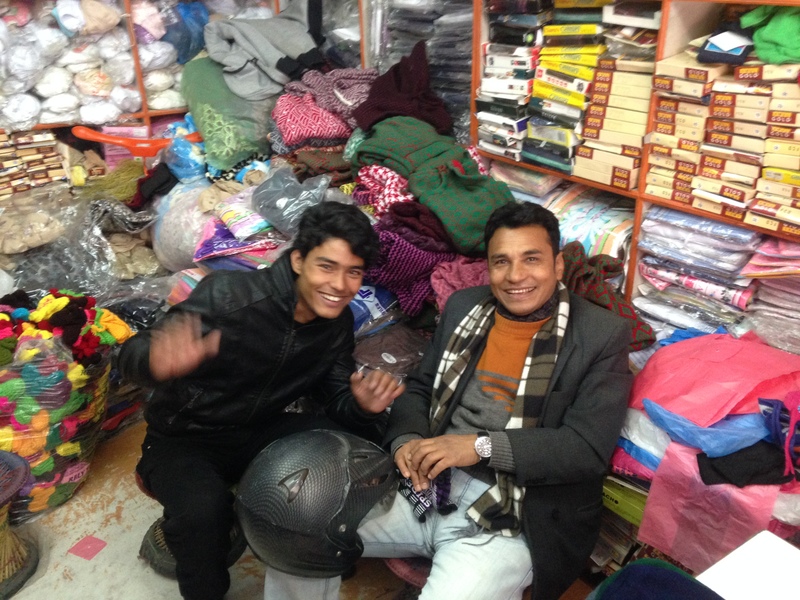 While in Kathmandu, we made some very affordable wholesale clothing purchases including, 300 pairs of gloves, 100 hats, and 100 jacket/sweat pant combinations. Further, the woman’s center at Kopila Valley produced extra Reusable Maxi Pad kits, so next week I am returning to Kalikot with one of last year’s Kopila Fellows to distribute the clothes, check in on the project, and distribute the Maxis. Clothes shopping for the project in Kathmandu! 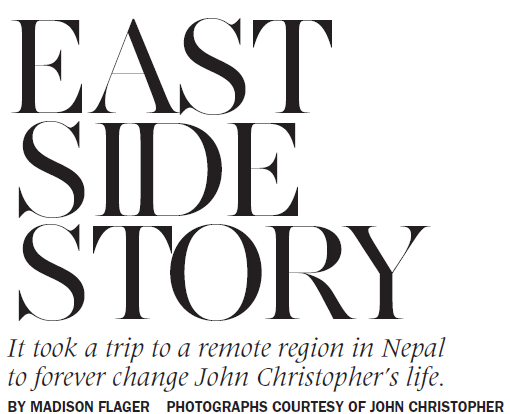 Beyond this news…On one last SUPER exciting note…my brother and author of two of the most recent blog posts is coming out to Nepal to help me on January 24th! 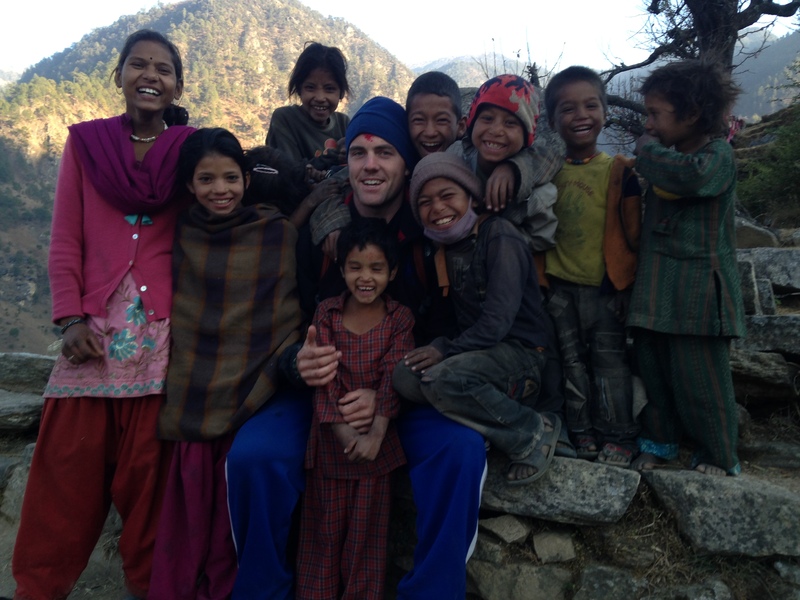 While I’m sad I won’t have him to help post to the blog, I am thrilled that he is coming out to join me in Kalikot. Not only will he bring a lot to the table in terms of teaching the children in the community, selfishly he will also be great company in a very remote part of the world! Hi Everyone! I hope you are all having a wonderful holiday season! As the title of this post suggests…We built a clinic! 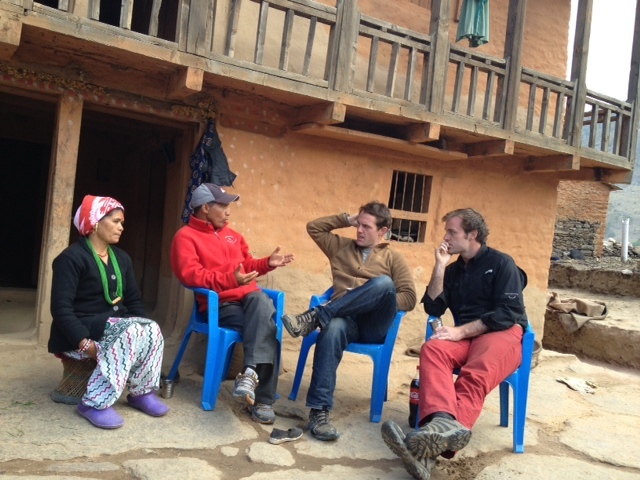 I very recently arrived in Surkhet, and am still decompressing from a very impactful trip up to Kalikot. But the moral of the story is that we did it! Despite the ups, the downs, the uncertainty, the doubts, the challenges…WE DID IT! We have a clinic and we are helping people who otherwise would not be helped. The immense satisfaction accompanied by seeing our first patient get treated pushed much of those frustrations to the back burner, and helped show that while there were bumps in the road…the road was still worth taking. 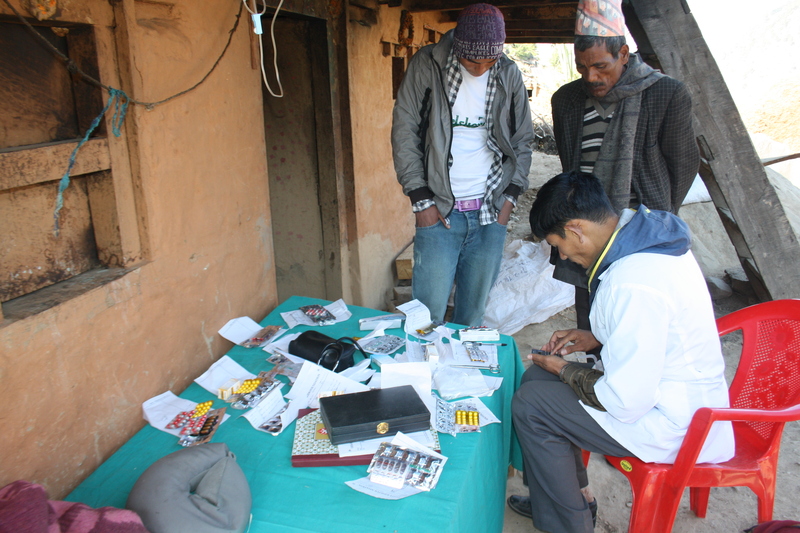 Karan, Doctor Karki, andI with our first patient! For now, I am in Surkhet and Kathmandu for the next several weeks to take care of some project related tasks, in addition to celebrating Christmas and New Year’s! 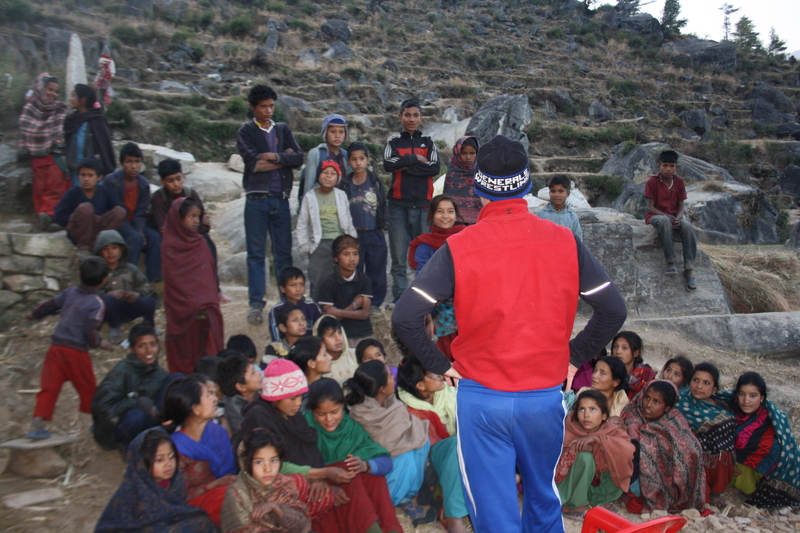 During these few weeks, I intend to pass along stories about my trip to Kalikot, stories about lives saved by OdaKids and Doctor Mim Bahadur Karki…along with stories about lives lost. These stories have taken some time to process, so today I plan to focus on the clinic and the extraordinary work done to get it set up in such a timely manner! On the morning day one we quickly learned that all of the medicine and supplies we purchased for our initial trip would not fit in the truck we hired for our trip up. 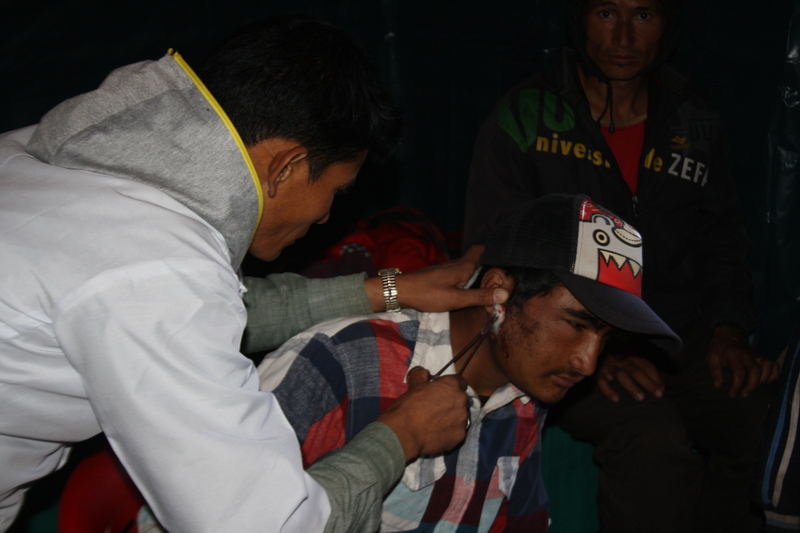 Responding quickly to the issue, Karan and Tope made some calls, and we were able to get our medicine on a bus up to Kalikot. Karan took the bike, as my brother mentioned we put a man on the bus to keep an eye on the medicine, and the rest of us squeezed into our truck for the journey up. After the twelve hour trip, we were warmly received in Sarabara which is the nearest road head to Oda. Due to some delays on the way up, we spent the night in Sarabara before heading to Oda the next morning. After some tea in the morning we were met by a large contingent of boys and men who came out to the street to receive us and carry our supplies from the truck and bus to Oda. 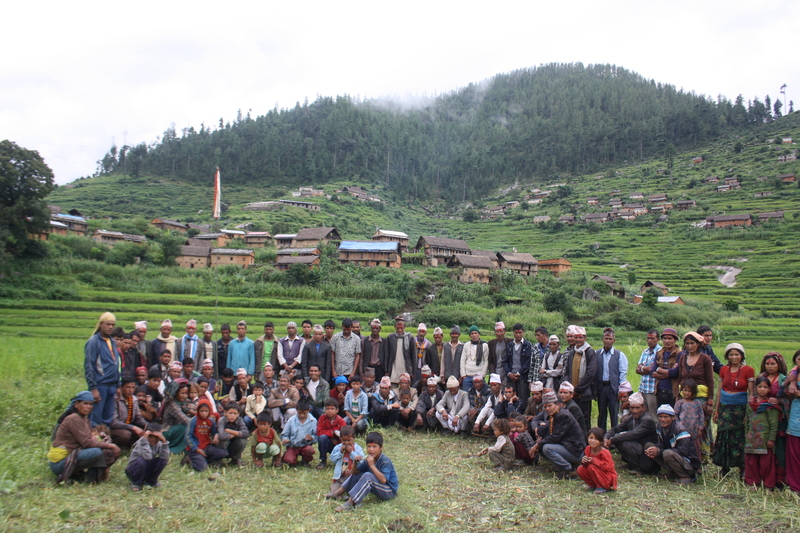 On our second day in Kalikot, we met with about 70 villagers in order to develop a cogent strategy for village involvement. During this meeting we established a Village Board with 4 members from the 3 neighborhoods in town. 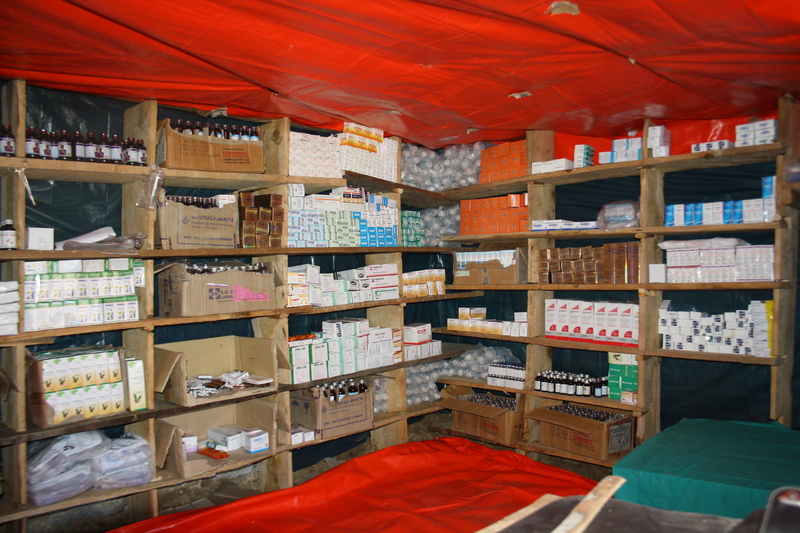 Each neighborhood has responsibilities which range from receiving medicine from the road head to working in the clinic. Months ago I mentioned the necessity for cooperation from the community, which would be imperative to project success. Almost immediately the village began walking the walk in addition to talking the talk. 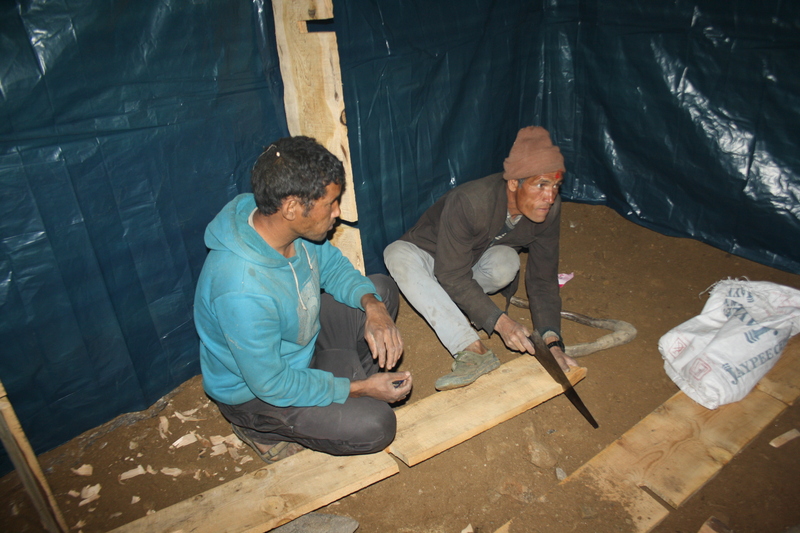 Each day a new group of men would come with additional supplies and material to work on the clinic. Whether they were building shelves, beds, tables, or installing a new solar panel the clinic and its development was hugely accelerated as a result of their eager support. As I mentioned in previous posts, due to financial constraints our clinic is housed in a large room in Karan’s house which used to hold his cows. This room needed some serious renovations to house a clinic. Despite our constraints, due to the army of workers and some positive attitude we were able to quite literally make something out of nothing. 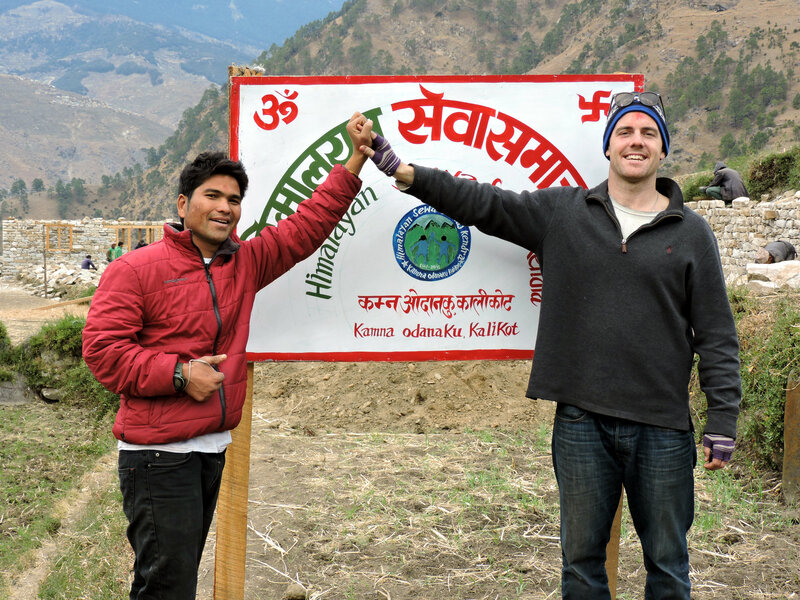 Having visited many clinics in Kalikot and Nepal for inspiration, our clinic is one of the best stocked and staffed in the region. Clinic under construction followed by our completed clinic! Concurrent to clinic construction our Doctor opened the clinic, where he worked for the first few days outdoors. This was an impressive feat, as he would diagnose people outdoors, and then run into our home to located medicine in boxes scattered throughout the house. Almost immediately his impact was felt, and through two weeks we averaged 41 patients a day. As my brother posted, in addition to working with villages from Oda, we opened the clinic to people from people outside of the community. The one difference is the amount they contribute is a bit higher, due to the financial realities of our project. That said, despite the increased rates people would come from hours away in order to see our doctor, some walking upwards of 3 hours each way. This speaks volumes to the lack of quality and affordable medical care in the area. In addition to having a quality doctor, we also have quality medicine which contrasts sharply too many of the other community clinics which are staffed by inexperienced medical practitioners and stocked with expired medicine. While I’m thrilled about our ability to help the community, people continued to come from further and further away in order to visit our clinic. This is a testament to the respect doctor Karki commands in the area, but is also sobering as we deal with how to treat the maximum number people on a limited budget. Numbers aside, after 4 days of construction we were able to move inside to our completed clinic. This move helped increase efficiency enormously, as the doctor was quickly able to retrieve medicine rather than having to hunt and peck through the house. In addition to the move, we hired one uncle (Dahn Bahadur) to serve as a general helper to the doctor, so he can focus on what he was hired for…to help people. Beyond Dahn uncle we also accepted a couple of volunteers to help Doctor Karki. Not only are they helping increase clinic efficiency, they’re also learning basic medical care…a skillset which will greatly benefit the community in the future. Doctor Karki hard at work! One last success story of the trip was the start of English language lessons. I will save this for a later post, but already we have 40 to 50 kids coming to each lesson hoping to boost their language skills and prepare for their exams. In just a few weeks their progress was amazing. I am already excited to get back up to the village and continue where we left off with English. I will be sure to pass along more updates very soon. In addition to working on project related tasks, I’ve also spent my time in Surkhet catching up with Maggie's team and her kids at Kopila Valley . Just yesterday I was able to take two students to the fair, where they were able to go on some carnival rides for the first time…while they were a bit sketchy, it was a ton of fun and they had a blast. Fun with old students in Surkhet...Laxmi and Puja! Until next time, hope everyone is doing well! Merry Christmas! Happy Holidays! The clinic has officially opened as of December 12th and has so far treated approximately 150 people (38 in the first day alone!). It was mentioned in previous updates that protocols were being determined with regards to the treatment of individuals (how many, how serious their condition is, etc.). As it stands, a daily limit of 40 tokens is handed out for folks to be treated, and each visit costs 100 rupees (approximately 10 cents). 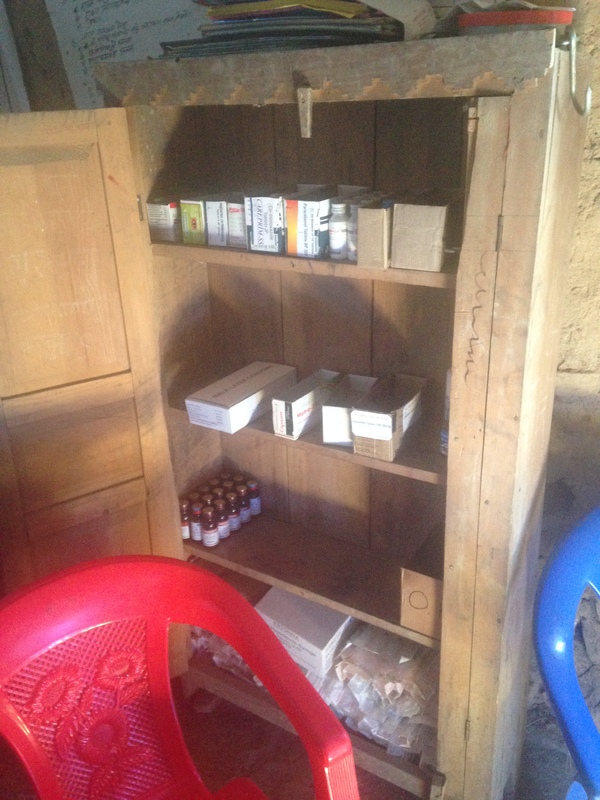 Additionally, the cost of medicine for patients is half of what was paid for it in Surkhet (before it is transported to Kalikot). Regarding this aforementioned number of patients per day, exceptions to the 40 token rule are made in the event that any sort of serious condition or accident arises. For example, the 2nd night that the clinic was open, the doctor, Karan, John, and a few others were having a celebratory dinner when they got news that a 3 year old baby had tripped and fell into a fire. 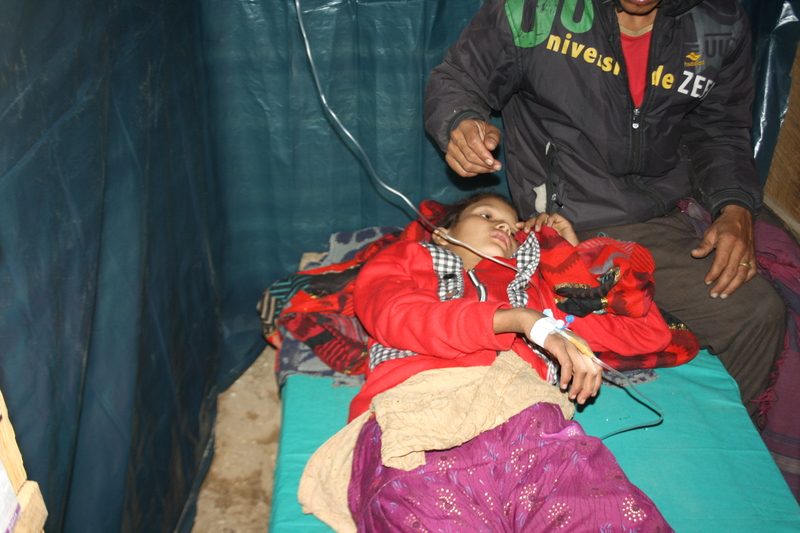 Mim Bahadur Karki ran off into the night to attend to the baby (who ended up with only slight burns on their arm). If he had not been there, the next nearest treatment would have been 5 hours away, but now the child is receiving fresh bandages and constant monitoring from the Oda staff. Mim Bahadur Karki is very highly regarded and is considered to be the best doctor in the entire region. 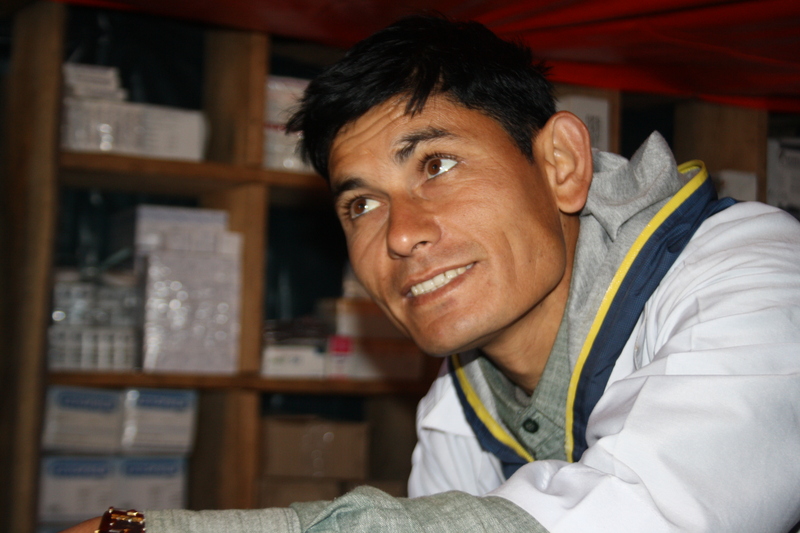 In addition to him, an administrative assistant for the clinic named Dahn Bahadur was hired, as well as an Auntie named Pulki (she helps out with cooking and various chores around the clinic and home). The Oda team is now 5 strong (John, Mim Bahadur Karki, Karan, Dahn Bahadur, and Pulki), and so far they’ve been accomplishing a lot together. We hope everyone is doing well, and the next update you receive will be coming from John himself!